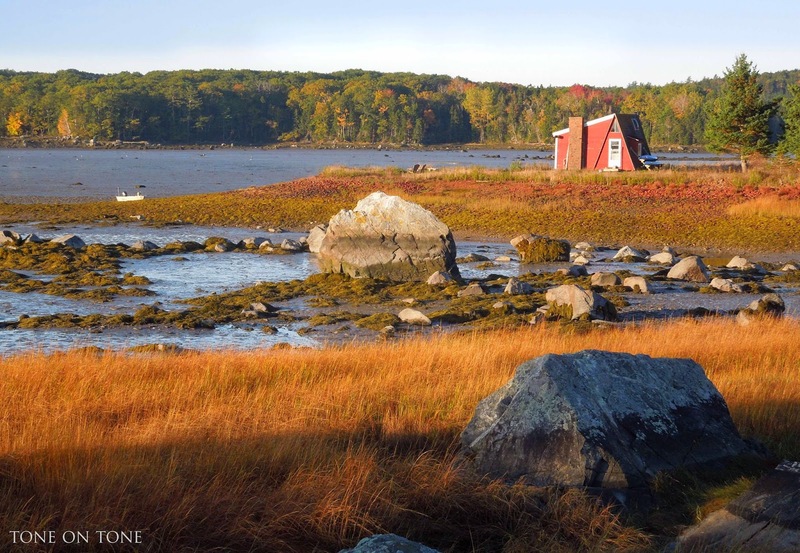 Maine is more than summer cottages, lobsters and lighthouses. 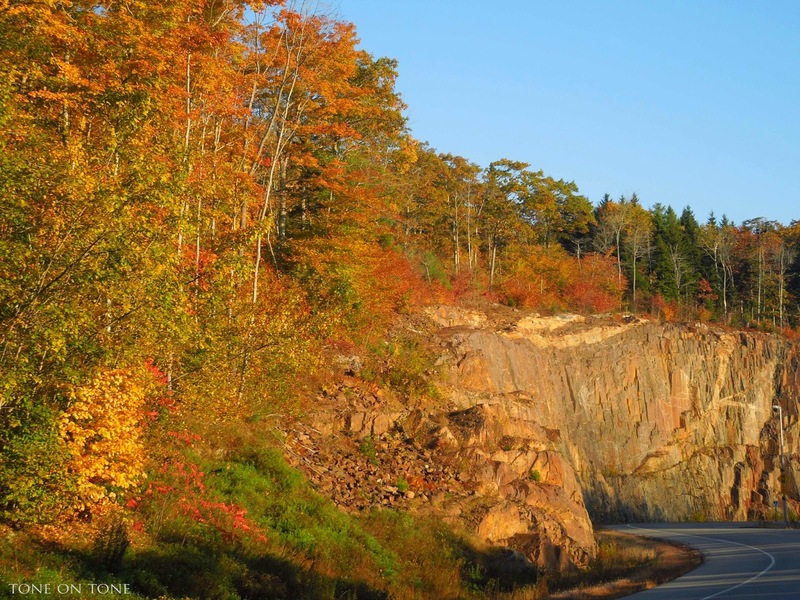 It's a place of stunning natural beauty, especially in the fall. There is a popular saying that there are more trees than people in this state. 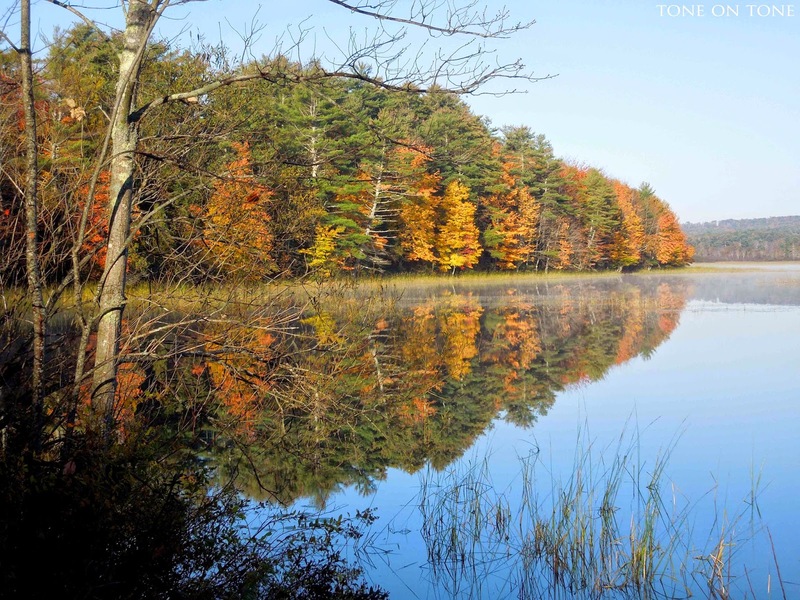 Imagine those trees aglow in brilliant shades of golds and crimsons, and how magical they are juxtaposed to the blue sea and lakes. 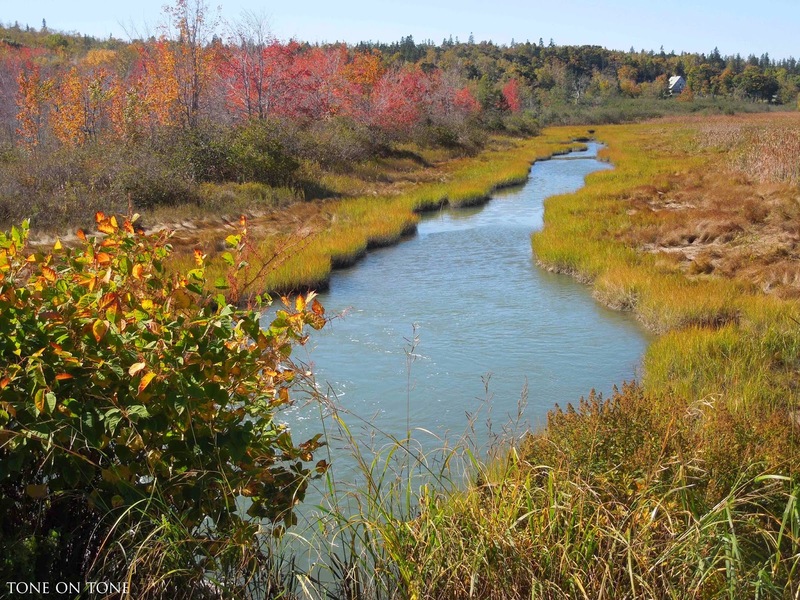 So come experience a luminous fall in Maine. 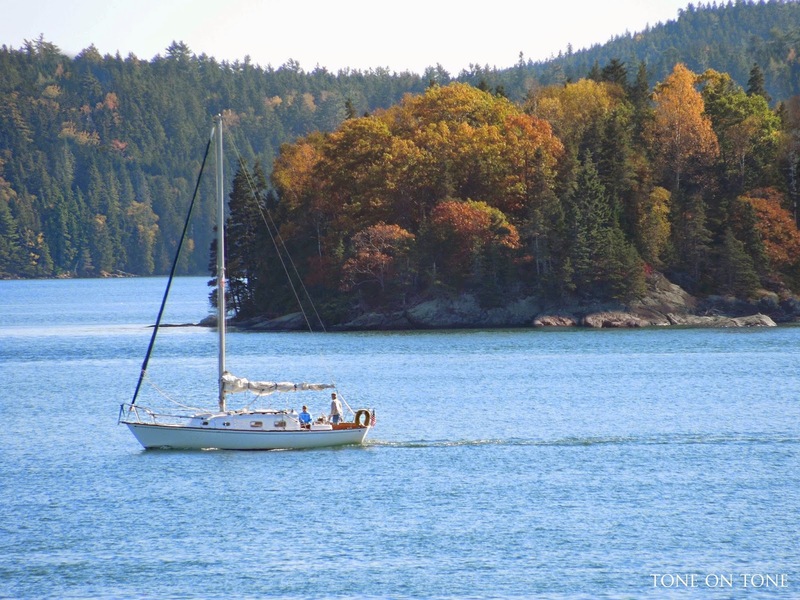 Our lovely town of Castine, which is even more special this time of year, is a must. 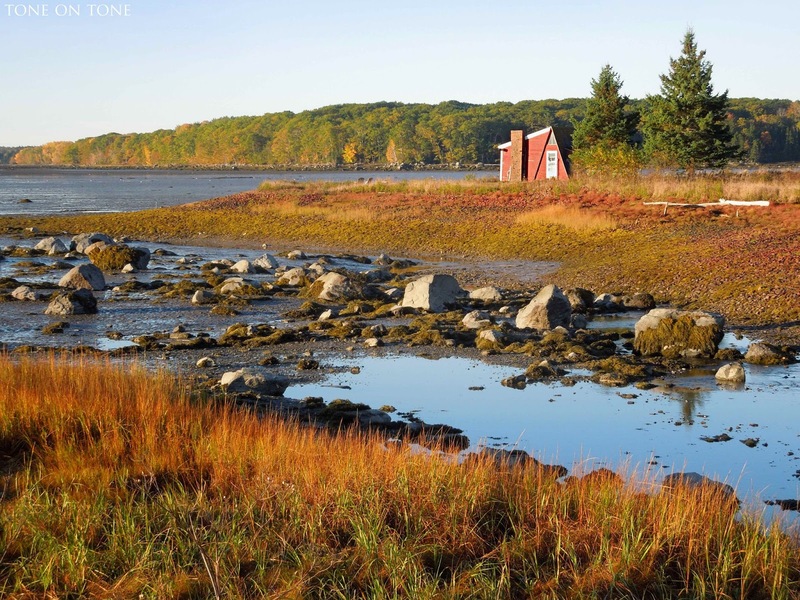 After all, Castine is "under the elms and by the sea!" For more information, check out the town travel site and Facebook page. 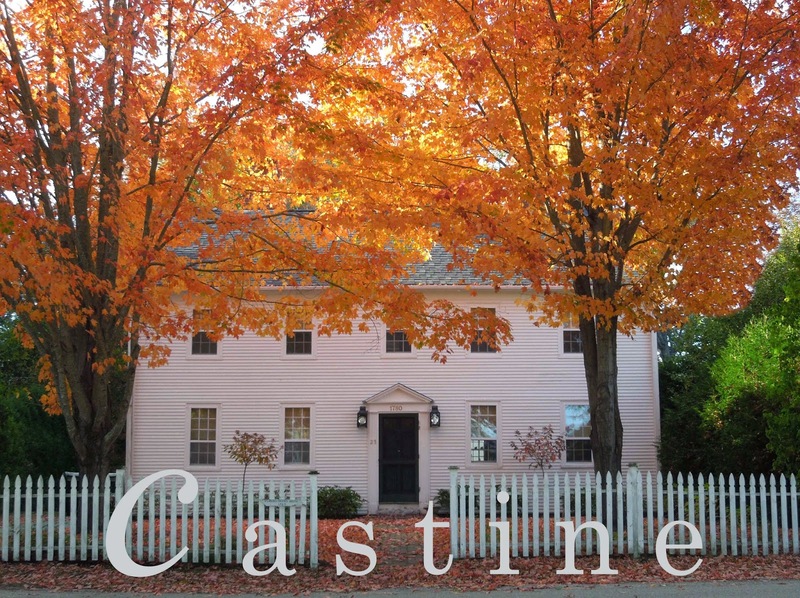 Also, visit the fine website of Castine Historical Society. At the British Canal . . . and almost home! 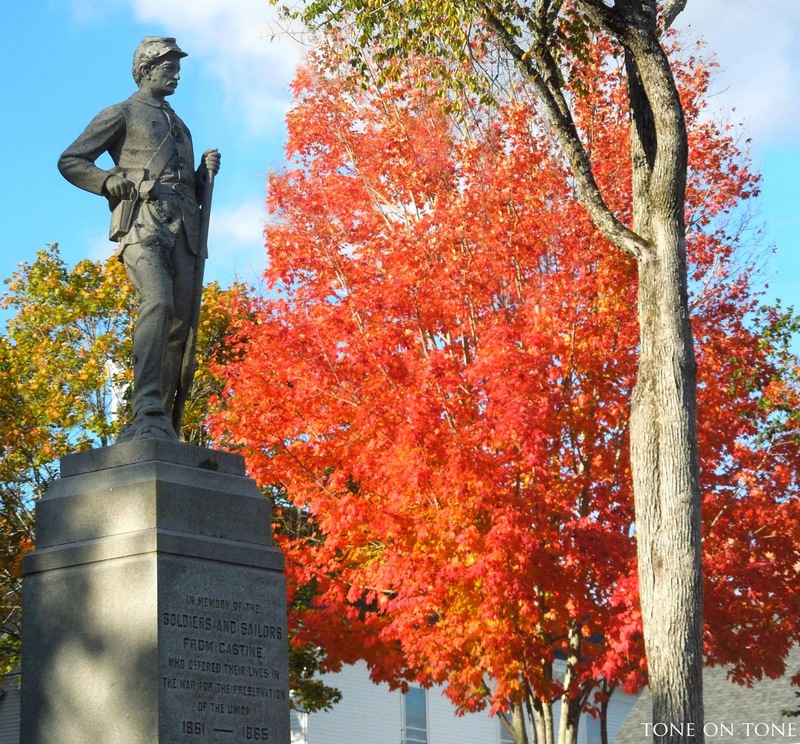 A spectacular fall moment on the Town Common. 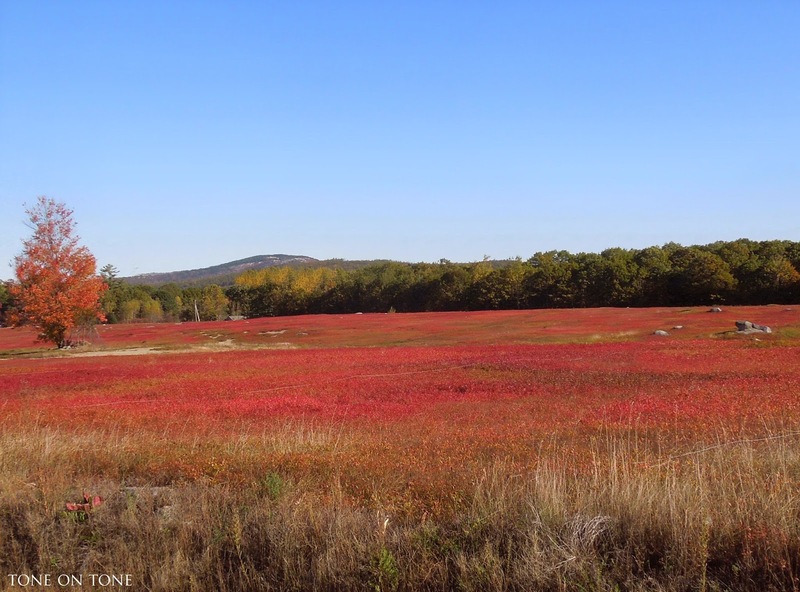 After Castine, be sure to take a drive to the nearby towns such as Blue Hill where the native wild blueberry fields put on a dazzling show. 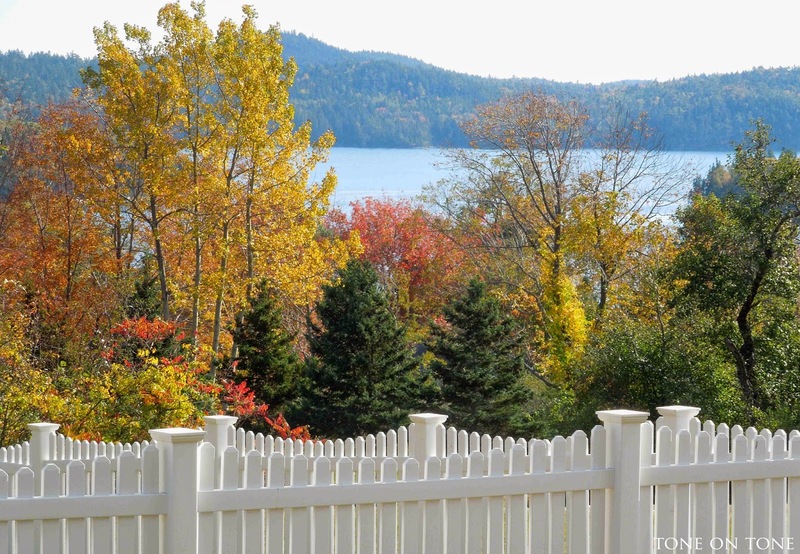 This charming little cottage in Penobscot has such an incredible setting. Guessing from the chimney, there might be a fireplace inside. If you are the owner, please invite me for a visit :) I'll bring lunch! 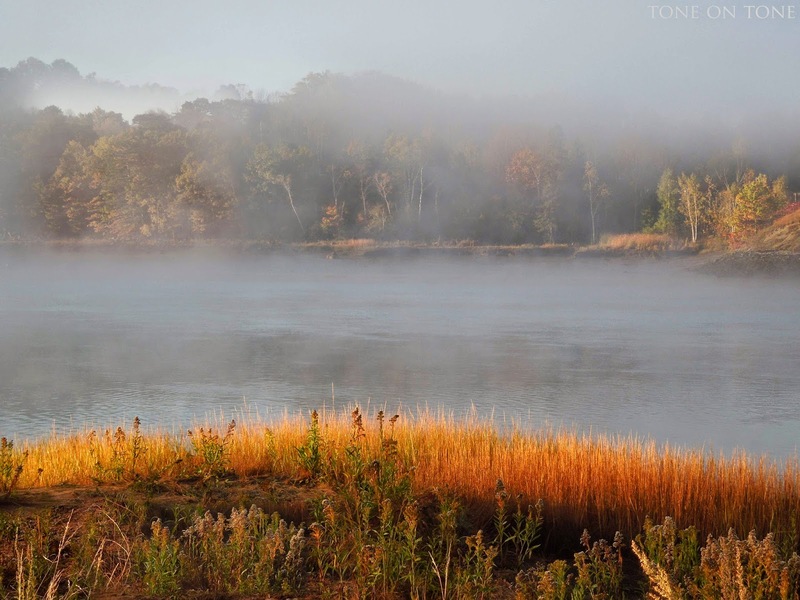 And rise early to experience the land and sea cloaked in fog - very Maine! 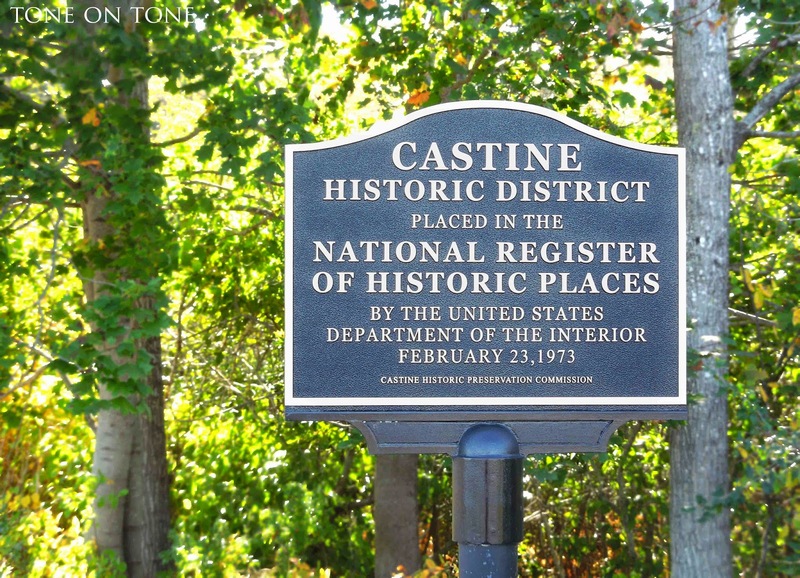 If you missed my post on Castine this past summer, read it here. There is a place like no other. 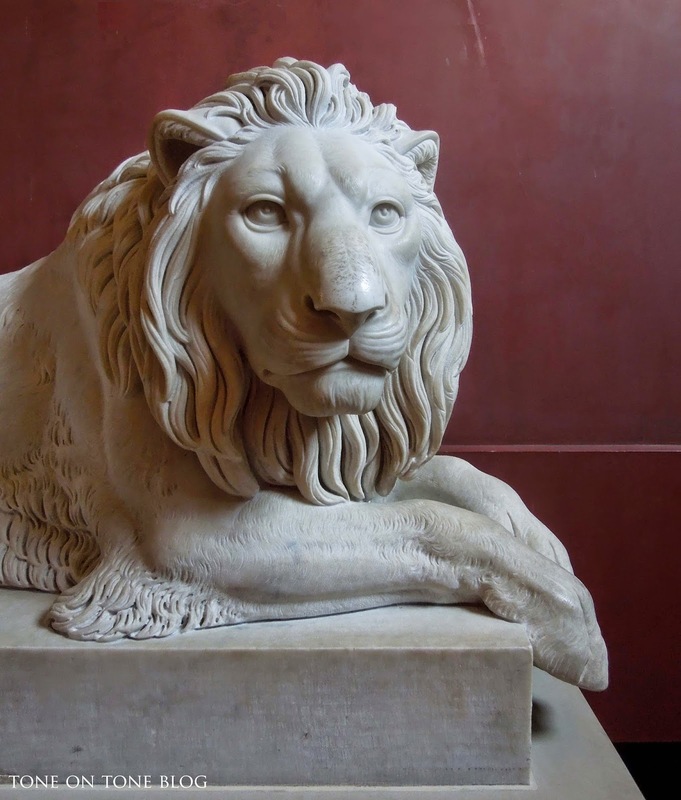 It's where one can slip in and out of shadows and into the light among gods and giants. It's a place of profound light, quiet beauty. 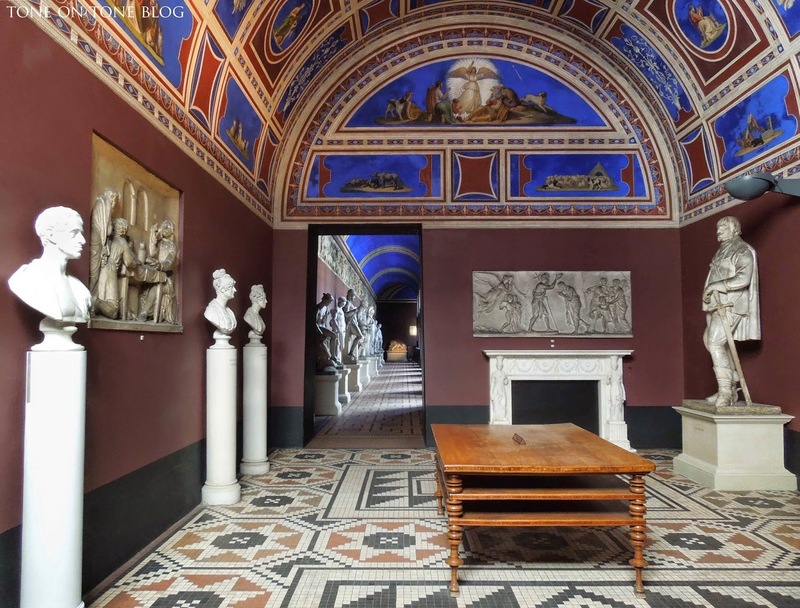 Welcome to the Thorvaldsens Museum! 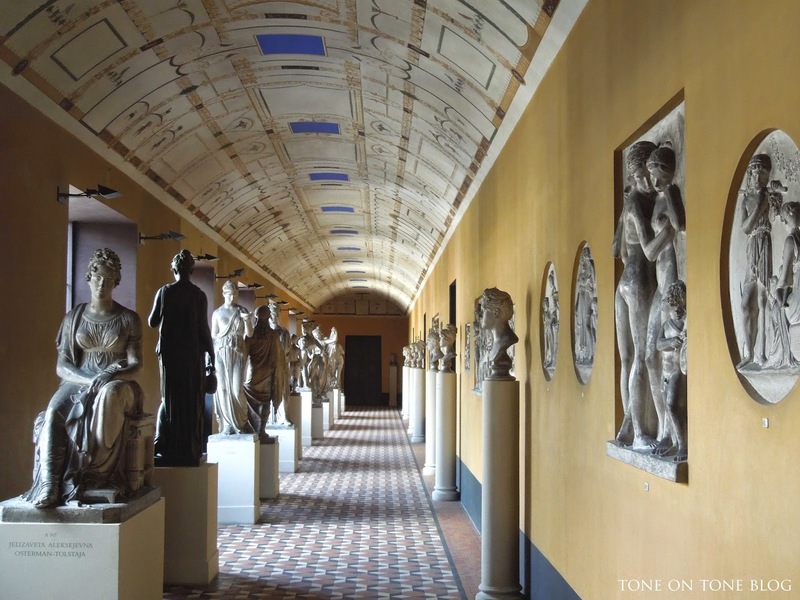 Opened in Copenhagen in 1848, this was Denmark's first museum. 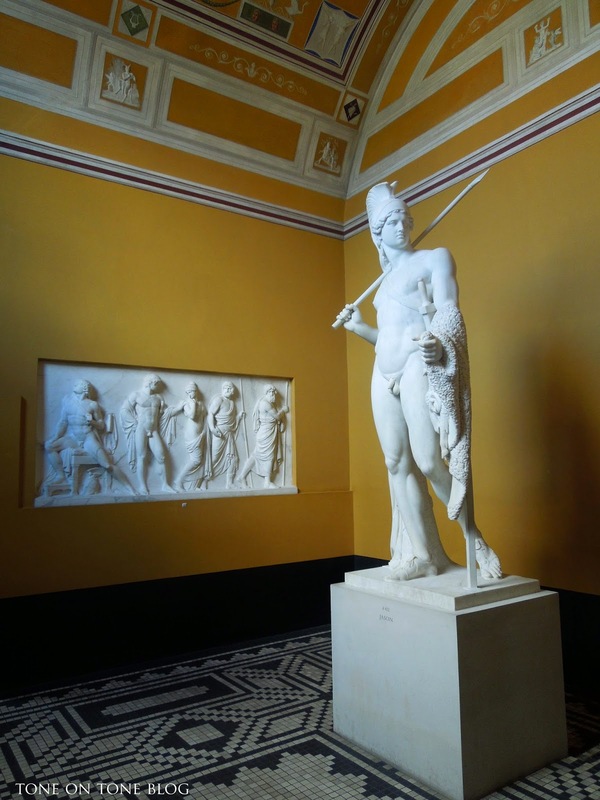 The magnificent Greek style building, designed by architect Michael Gottlieb Bindesboll (1800-56), houses an astounding collection of sculptures in marble and plaster by Danish sculptor Bertel Thorvaldsen (1770-1844). 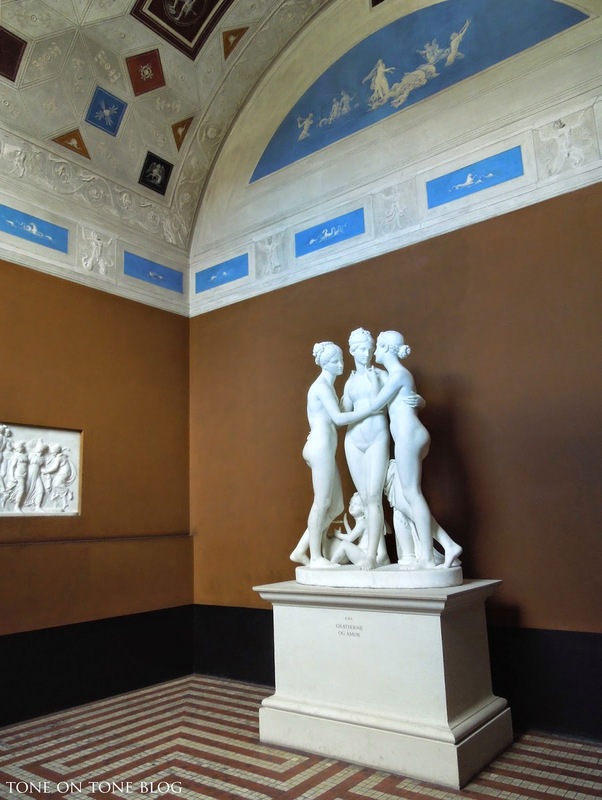 After training at the Royal Danish Academy of Fine Arts, Thorvaldsen gained international recognition in Rome, where he worked for more than 40 years. 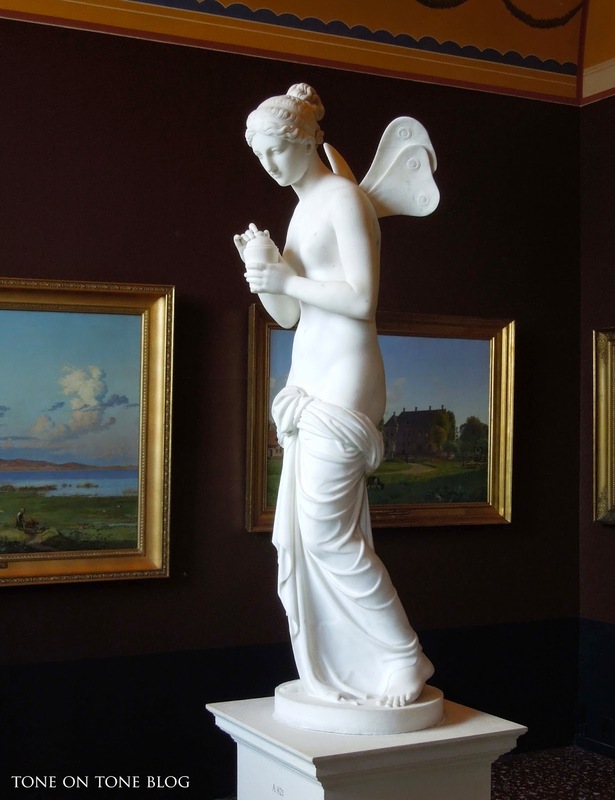 His pieces grace many cathedrals, state buildings, public squares, and museums throughout Europe. 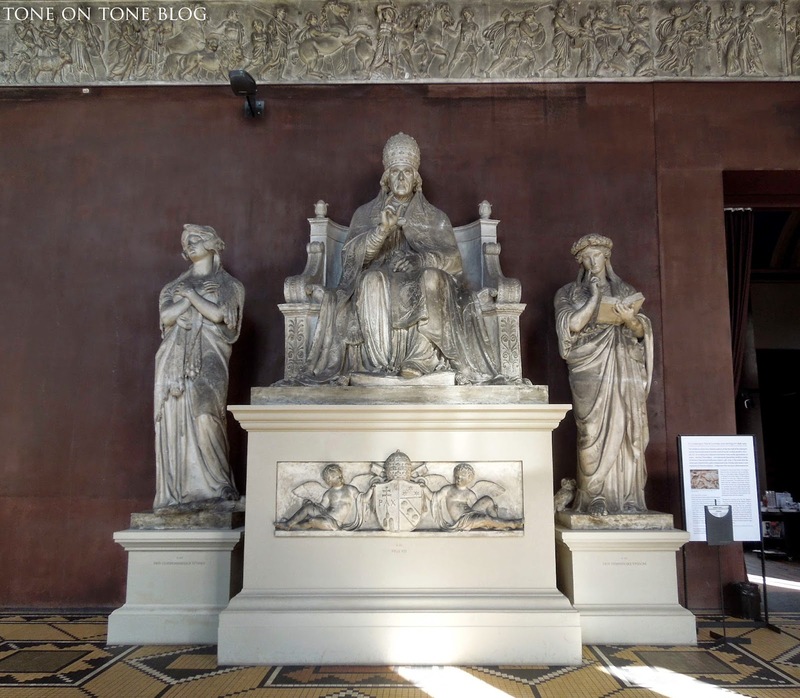 I returned recently on an autumn day to this museum. 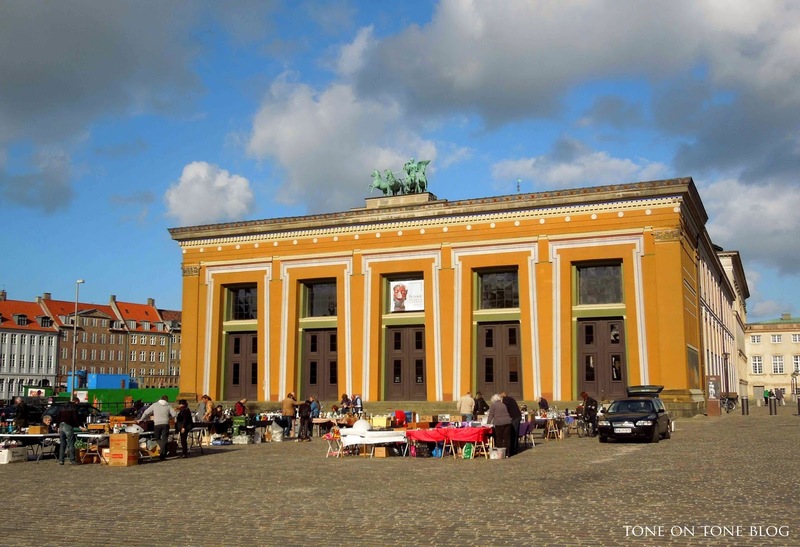 A little flea market popped up in front of the Thorvaldsens Museum. Naturally, I browsed. The Grand Hall runs the length of the front of the building. 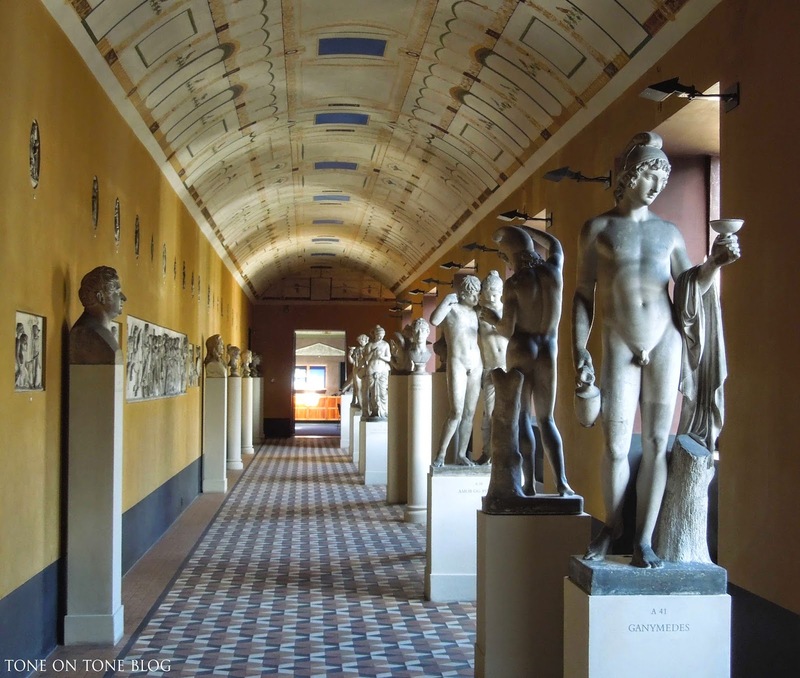 Many of these monumental plaster figures were models for bronze statues. 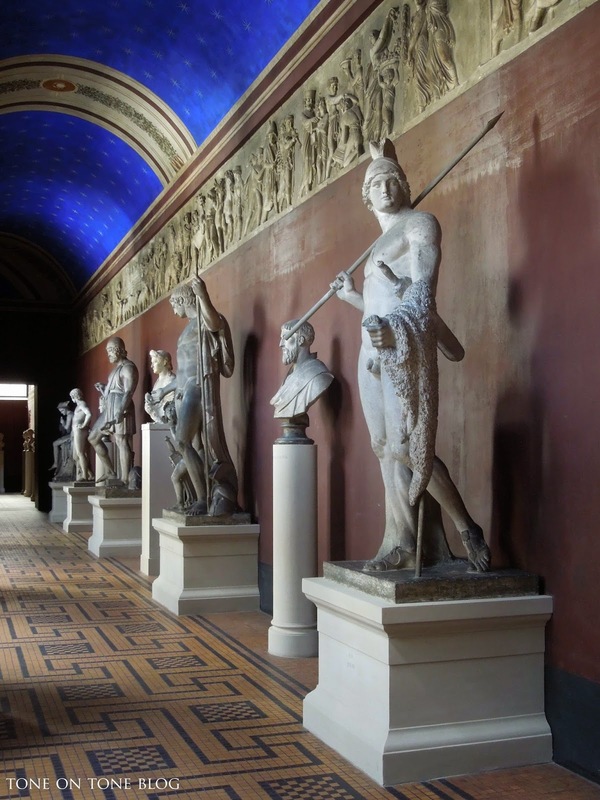 In addition to the phenomenal sculptures, the building itself is resplendent with its ornate plaster ceilings, tiled floors and brilliant colors. 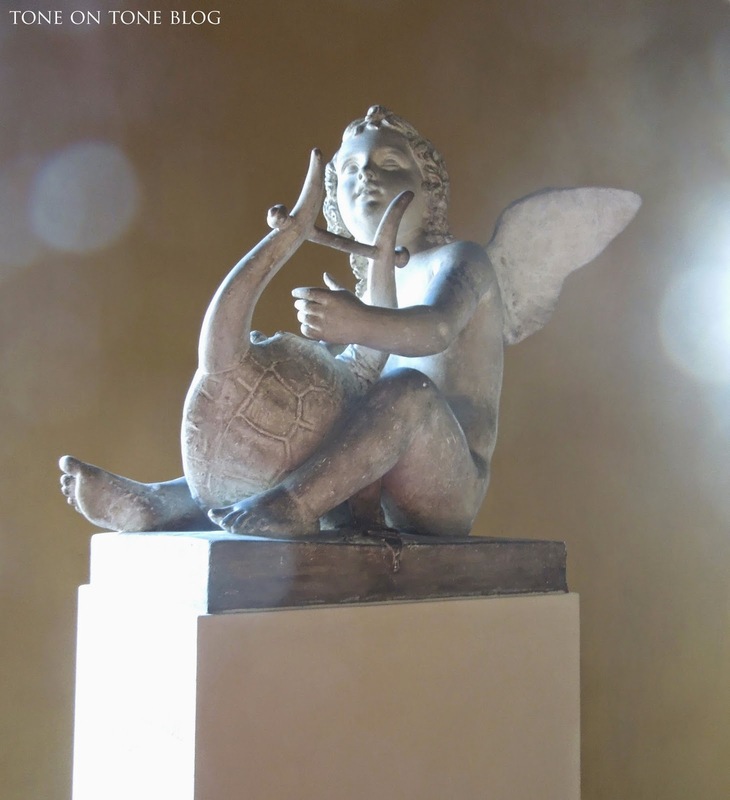 ABOVE: Ganymede and the Eagle. 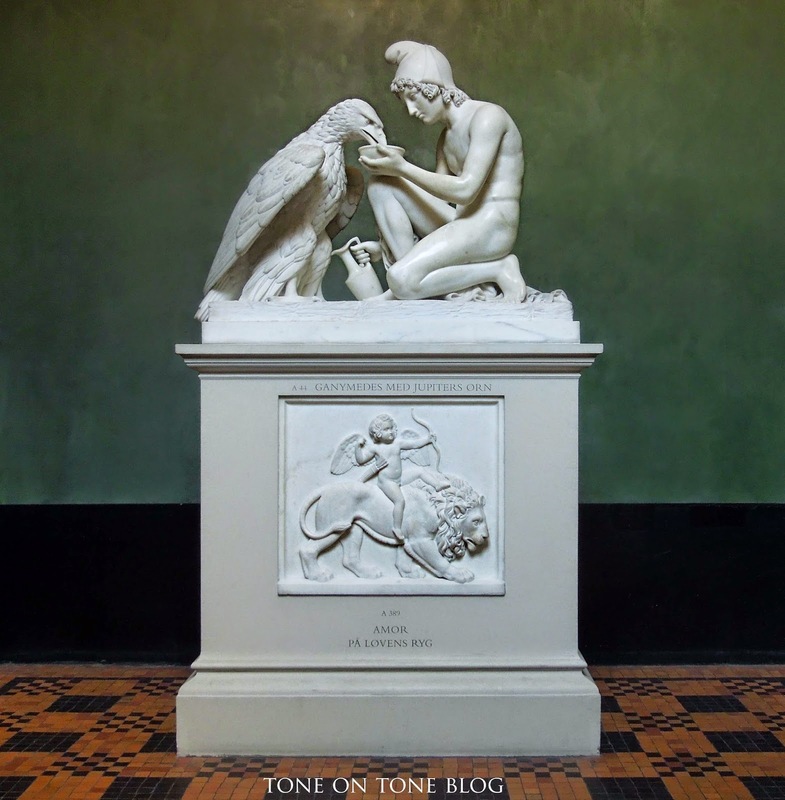 In Greek mythology, Ganymede was abducted by Zeus, in the form of an eagle, to be cupbearer to the gods. 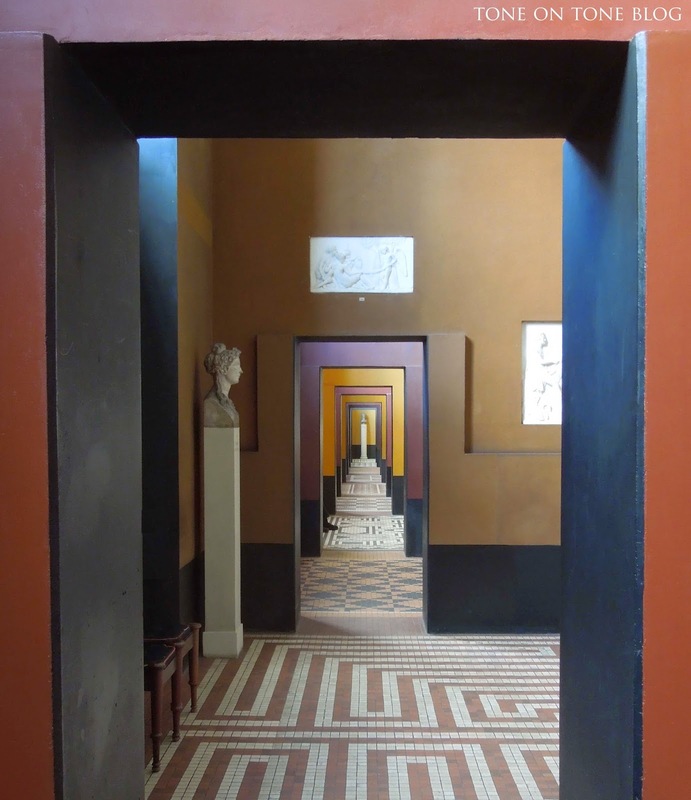 A long view of the galleries painted in vivid colors. 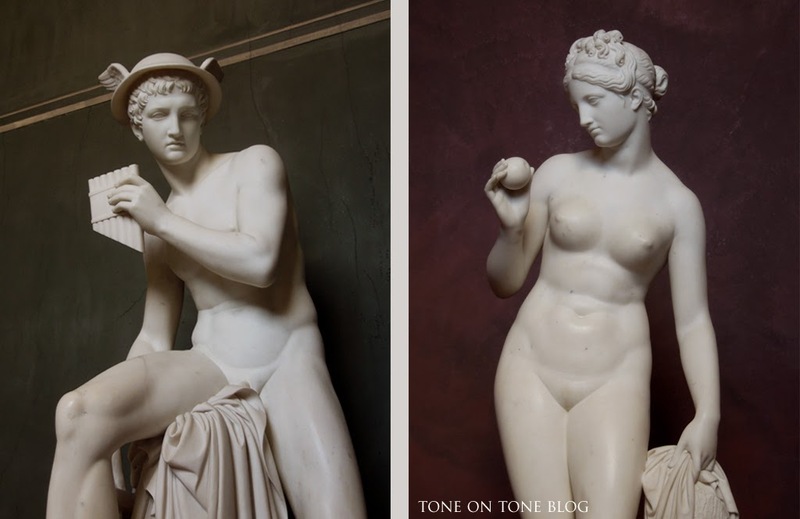 In this setting, the monochromatic sculptures look especially striking. Look up! 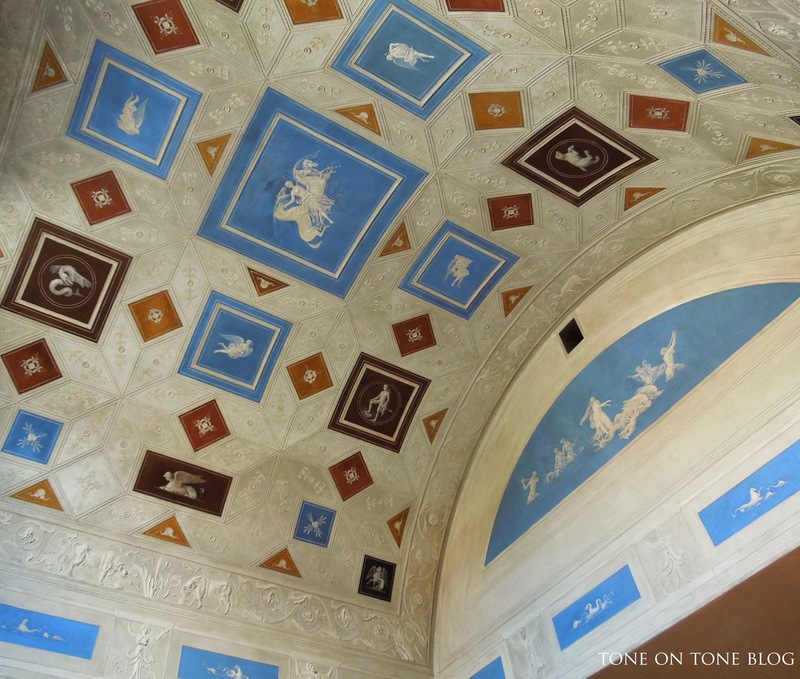 The ceilings, inspired by Pompeii, are lavishly decorated. 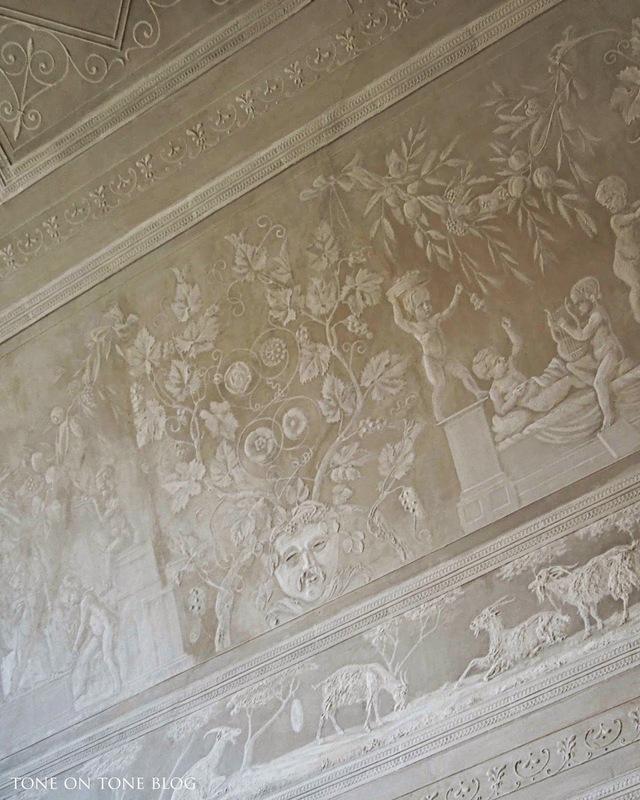 ABOVE: A tone-on-tone ceiling executed in grisaille. 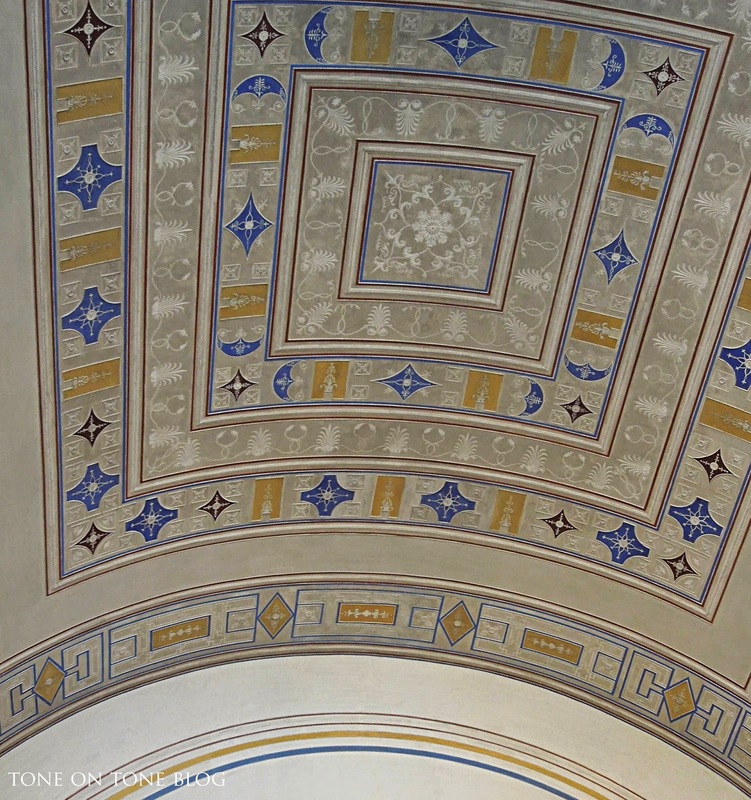 Two beautiful ceilings that remind me of Wedgwood's Jasperware. 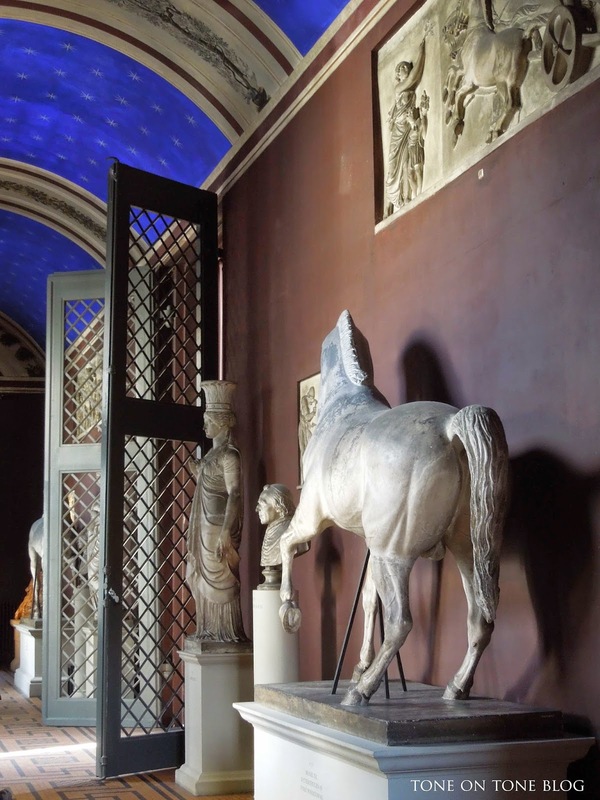 Weaving around the sculptures, the light seems to dance down these corridors. 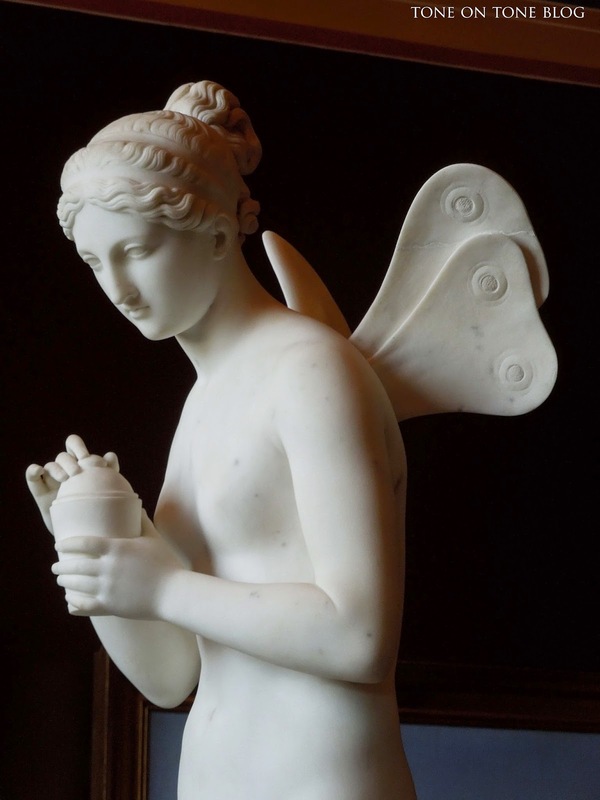 The very beautiful Psyche, Greek goddess of the soul, carved in marble. 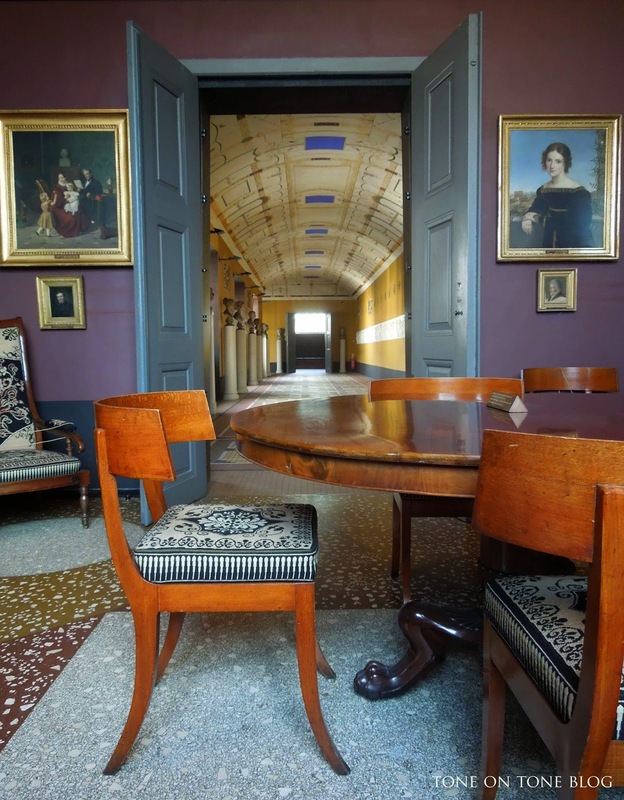 The museum also houses Thorvaldsen's art collection and furnishings, like these portrait paintings and handsome klismos chairs. 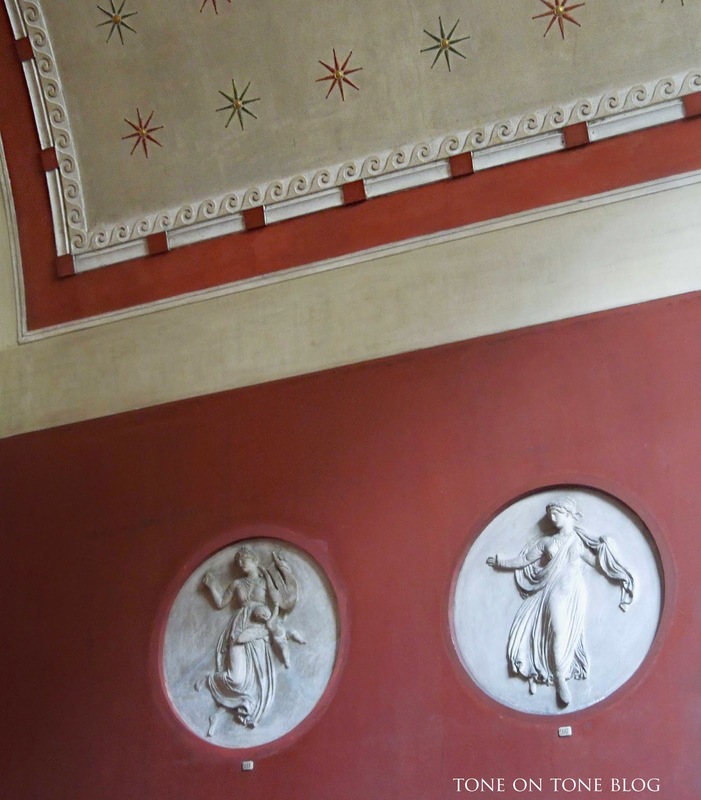 Many copies of Night were made, including this plaster roundel in our living room. 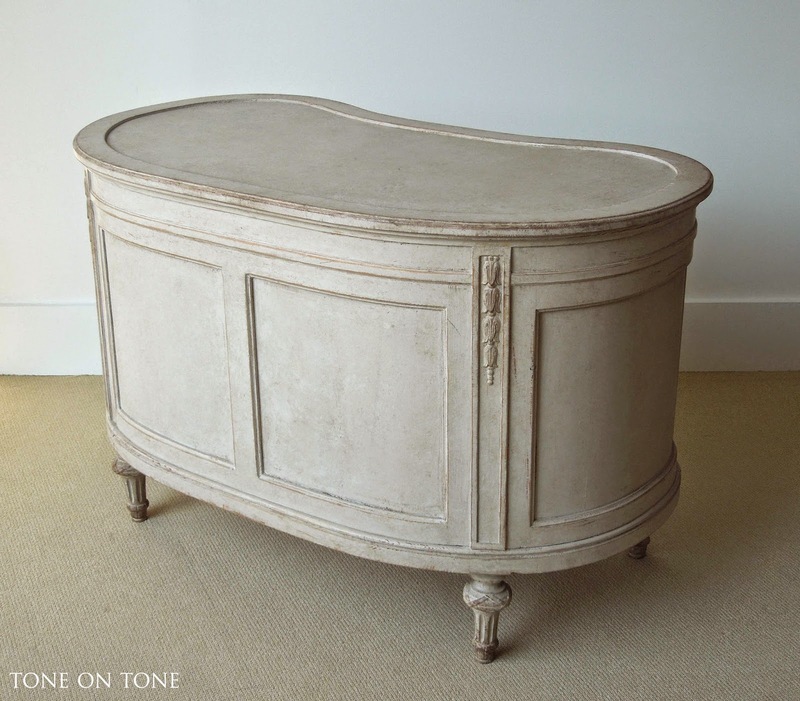 Our piece is from the 1890s, and it came out of a building in Boston. 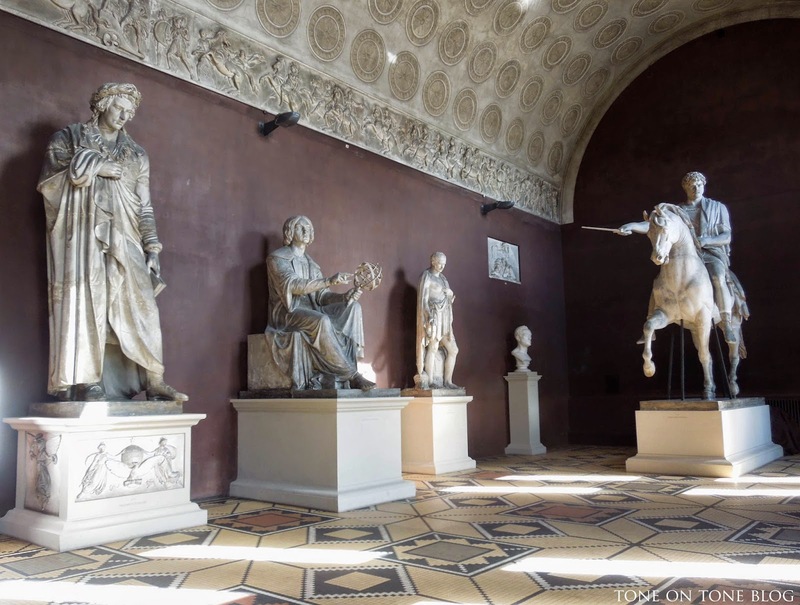 For more on this museum, please check out my friend Phyllis' visit there. You'll love Phyllis' photos! And enjoy more of her work here. Happy October! 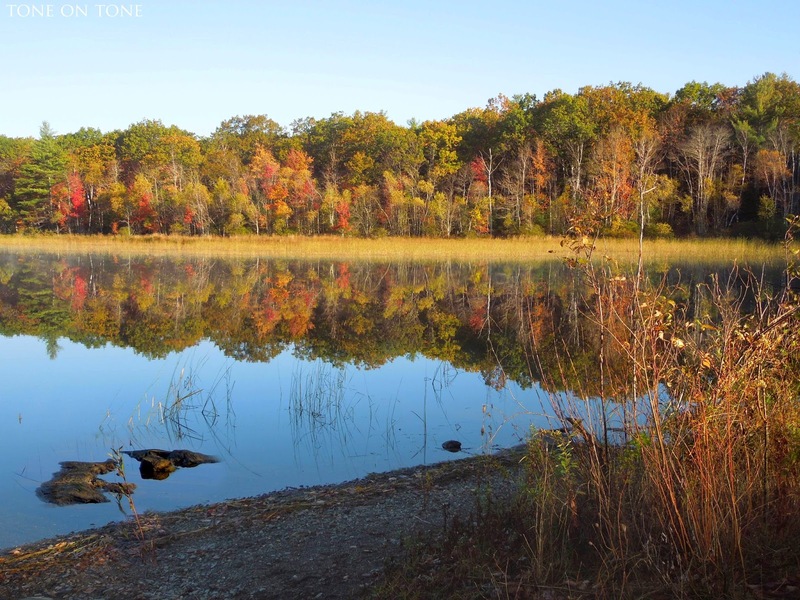 After enjoying a bit of an Indian summer, it's now looking and feeling more like fall in DC. 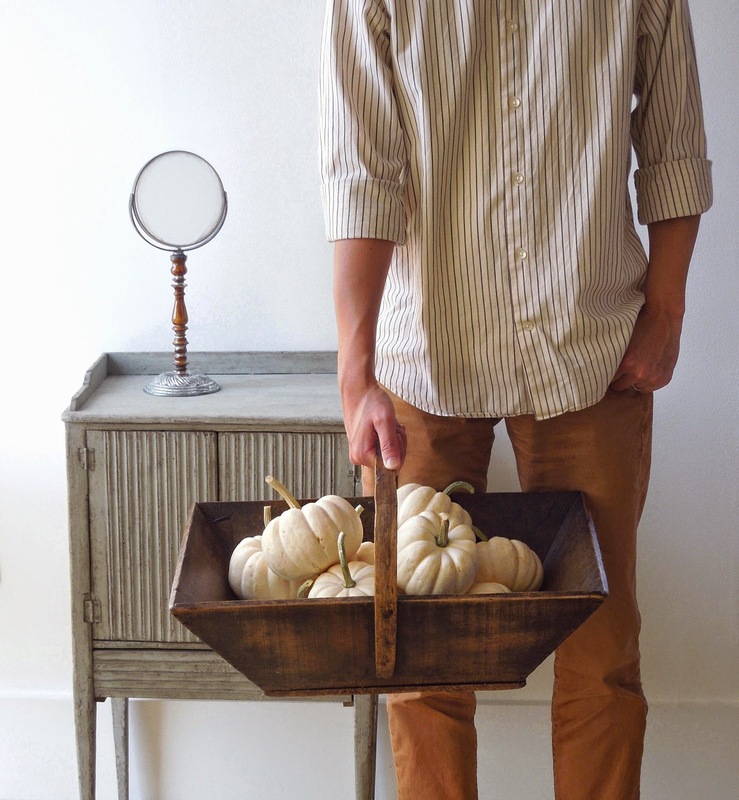 Have you added any seasonal touches to your home? 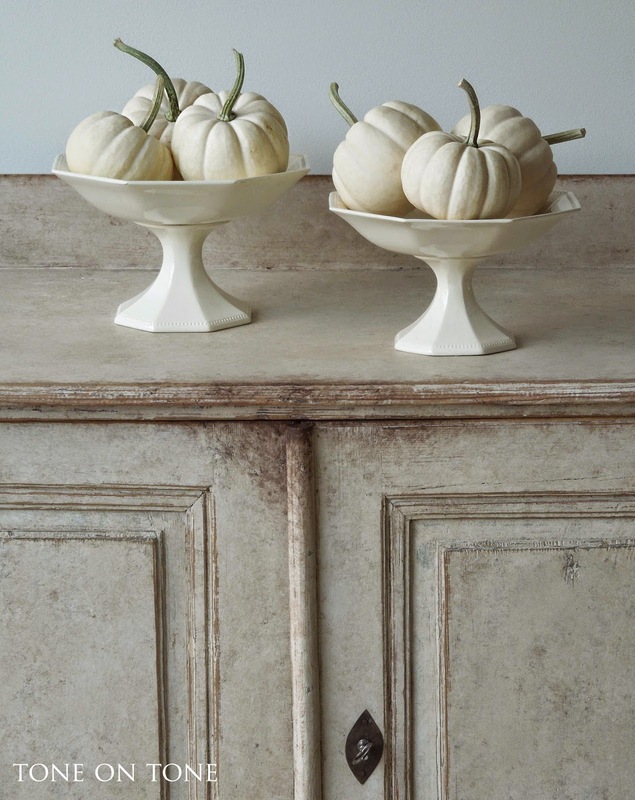 I just brought in a few white pumpkins.Ten years ago, when I wanted these ghostly beauties I had to trek north to my favorite farmsteads in Lancaster, Pennsylvania. Now, they and many other specialty pumpkins and gourds can be sourced locally at grocery stores and nurseries. I have a friend who even grew his own white pumpkins from seed. It's fun to see how popular they have become. 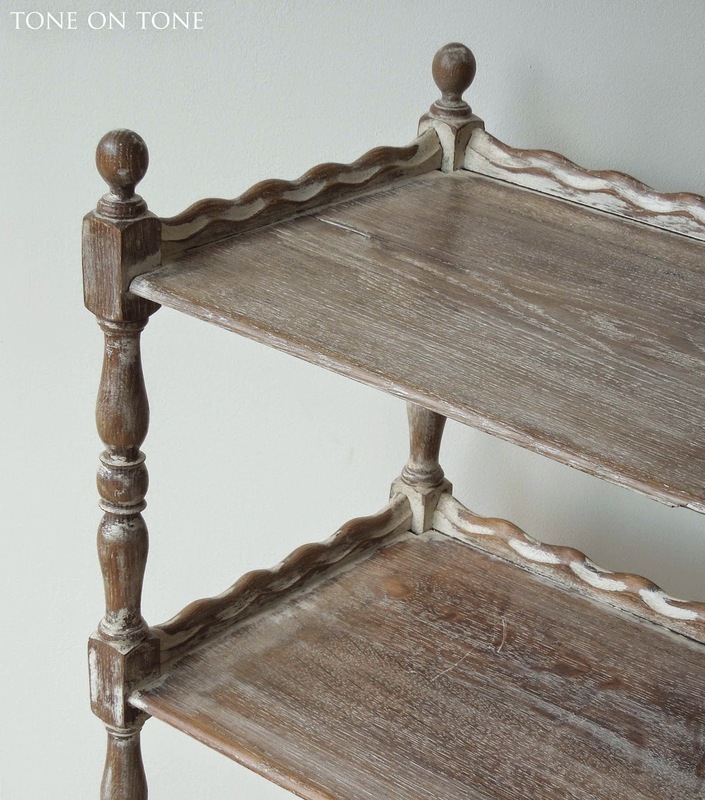 Enjoy this tour of the shop as well as a few new arrivals! If you have questions about any of the following pieces, please email me at topiaryplants@gmail.com. I went to the market with my garden trug and . . . 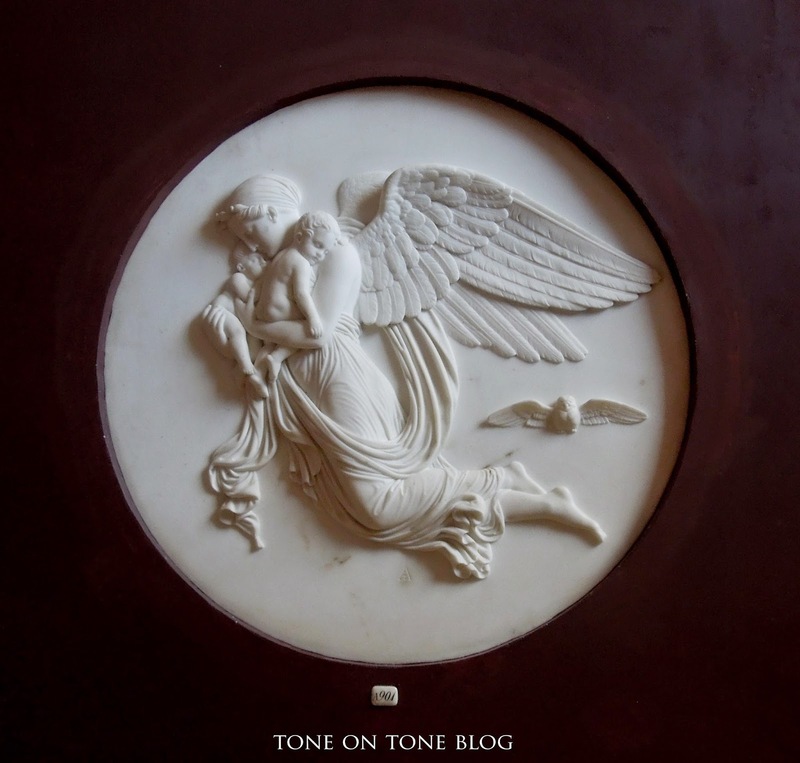 Here is a trio on an antique English Wedgwood creamware platter. 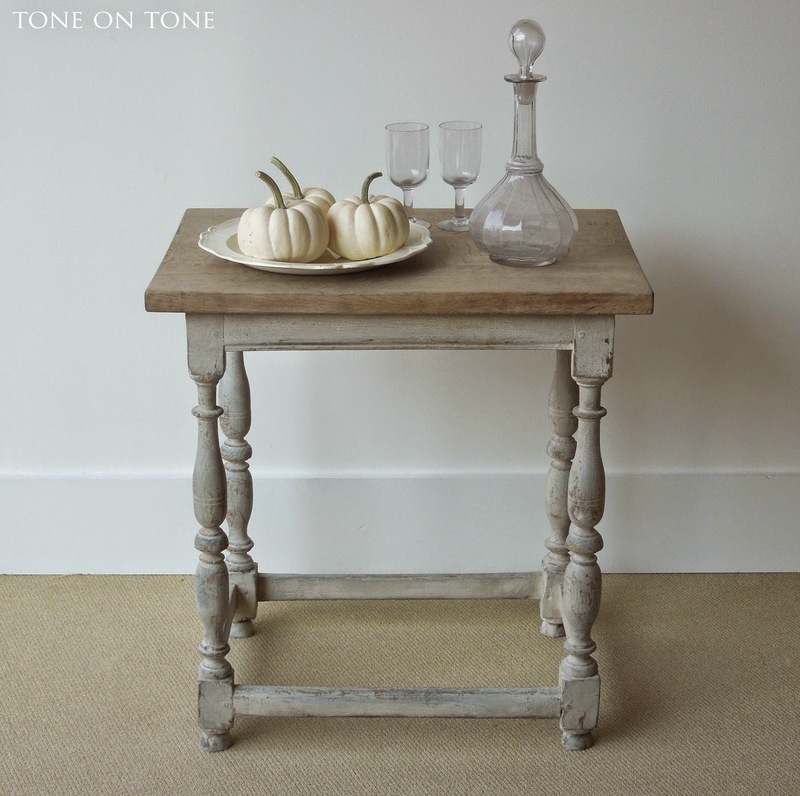 The Belgian oak table has a bleached top over turned legs painted gray. 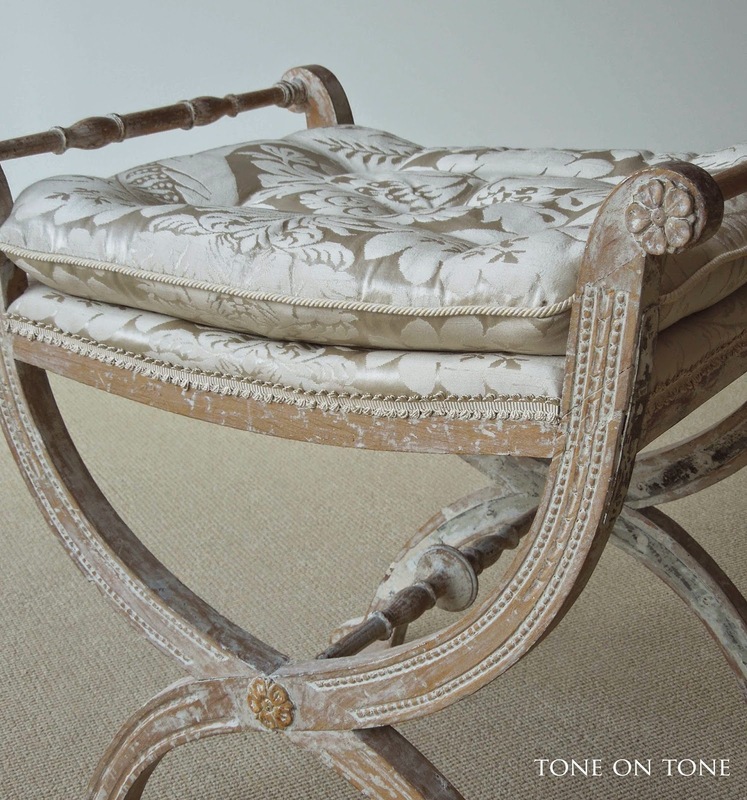 The French armchair / fauteuil has been reupholstered in a quilted fabric from Nancy Corzine. 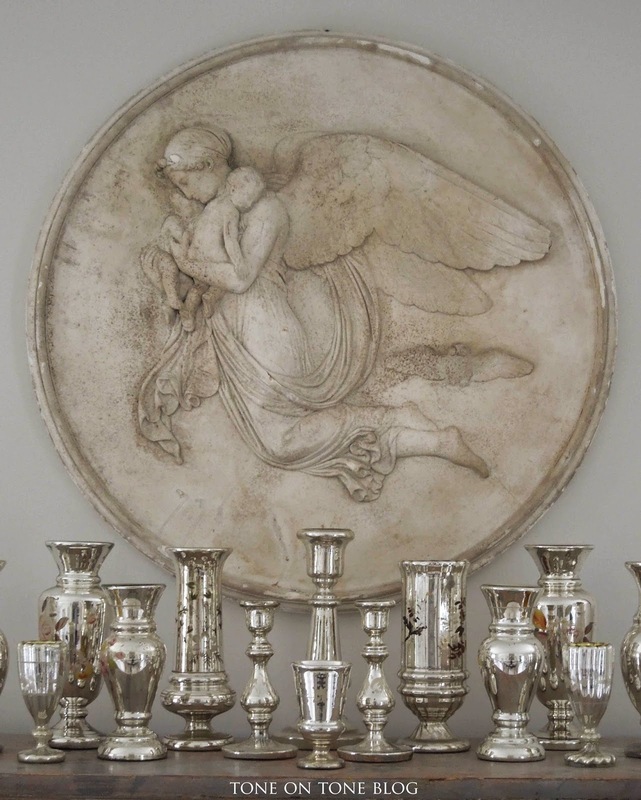 Both pieces date from 1870-1900. 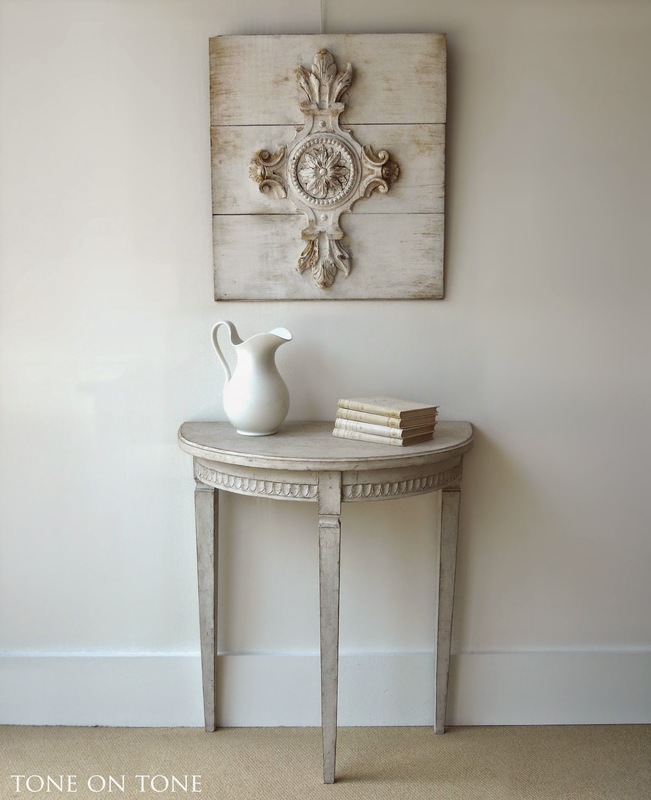 Traces of old paint and elegant carvings add texture to the simple frame. 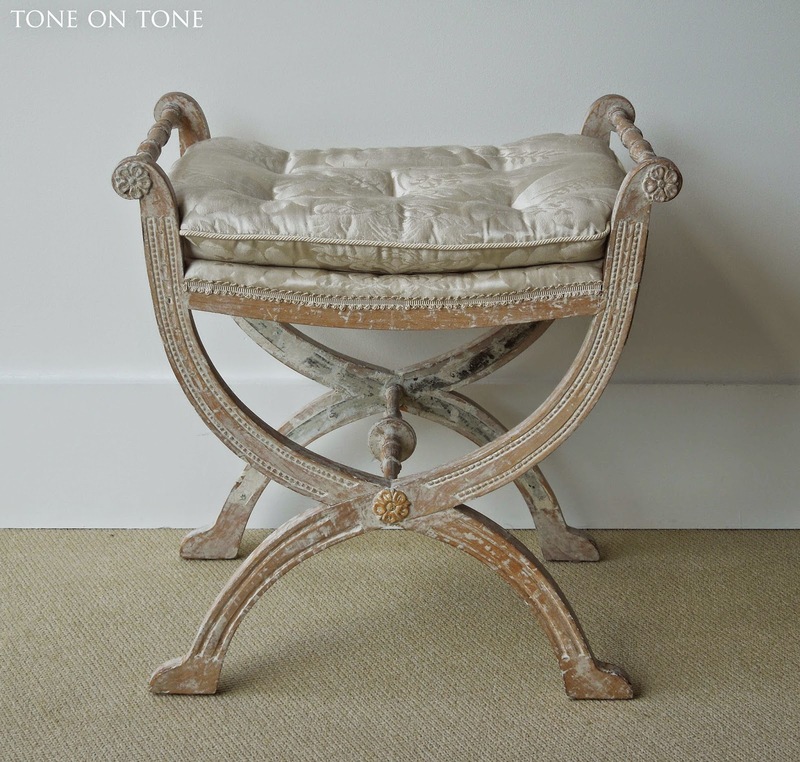 I can see this chair accenting a bedroom, library, living room, etc. 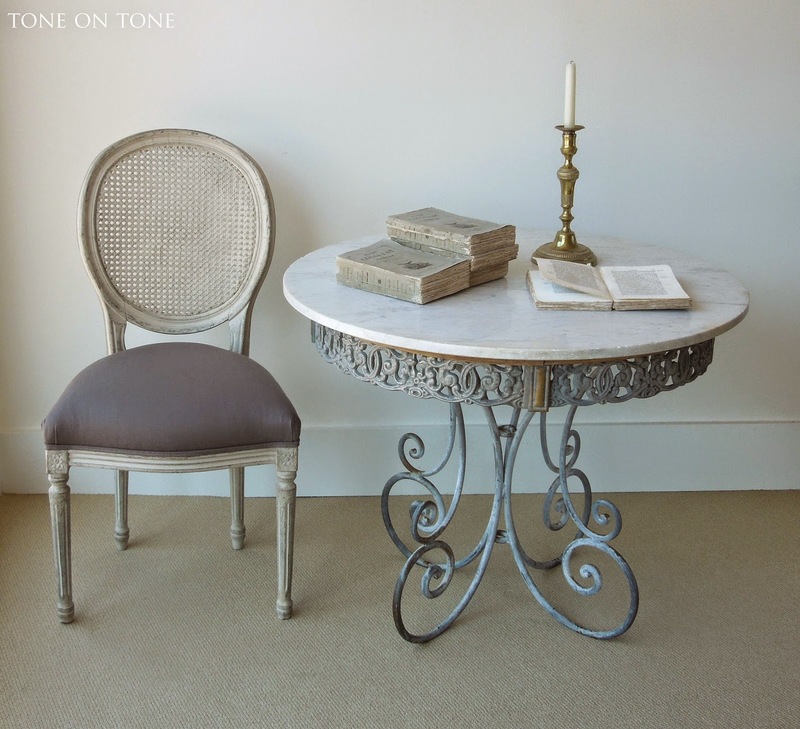 ABOVE: A sculptural Thonet bentwood table that would be charming as a small center table. 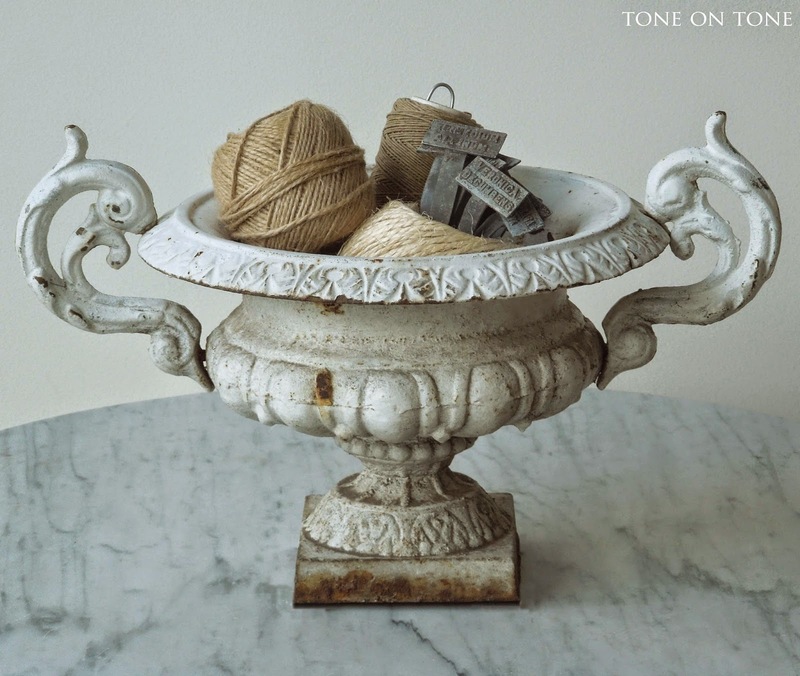 BELOW: A French cast iron urn as a catch-all for garden accoutrements. 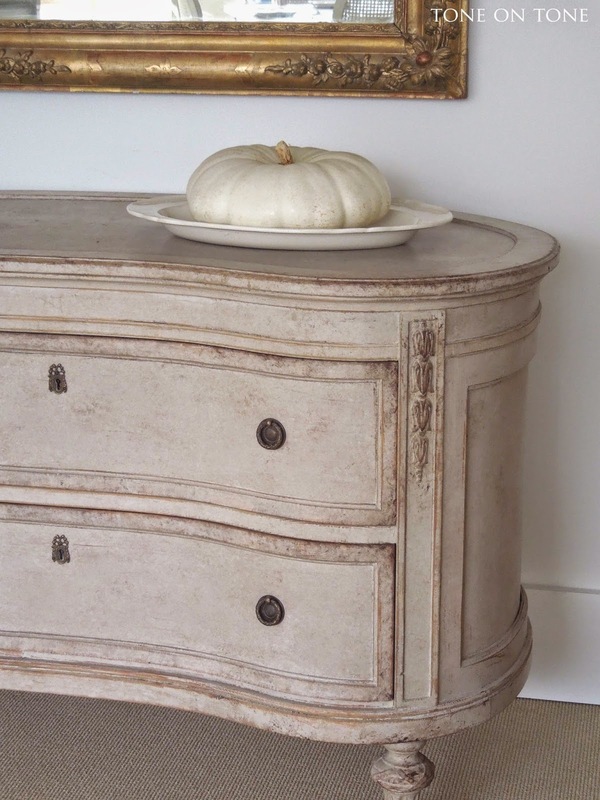 Mini white pumpkins would be cute in the urn as well. 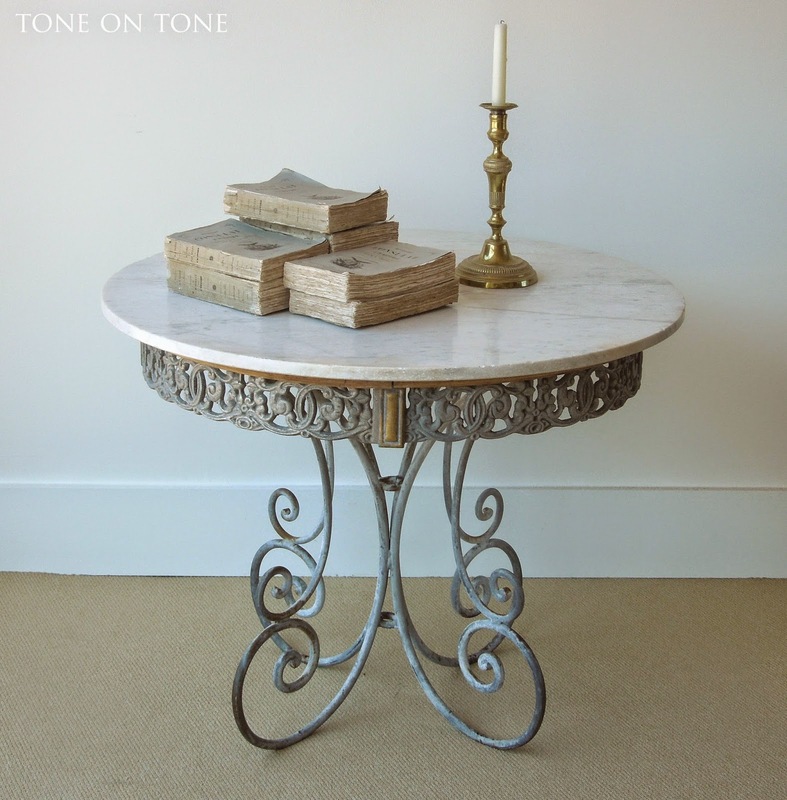 This is a striking French round table with zinc base and marble top. 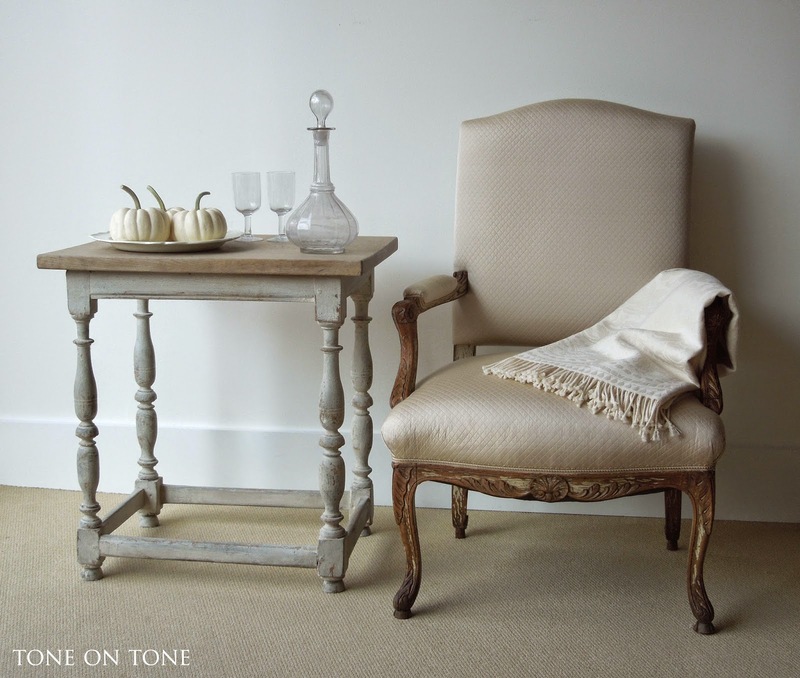 The fretwork apron and scrolls on this sturdy table have such movement. 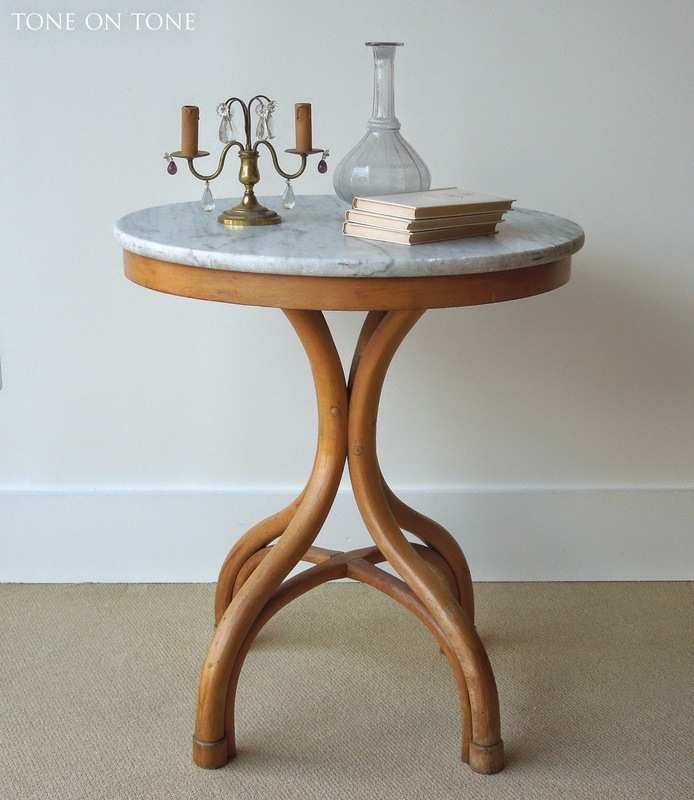 Originally, there were castors so I wonder if this was a pastry or even a conservatory worktable? 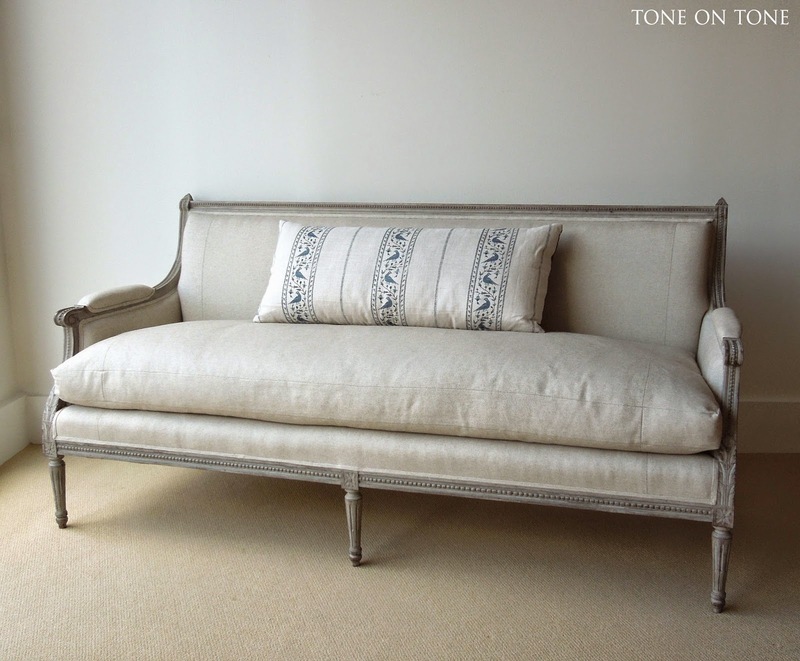 This French or Swedish painted sofa recently came back from my upholsterer. 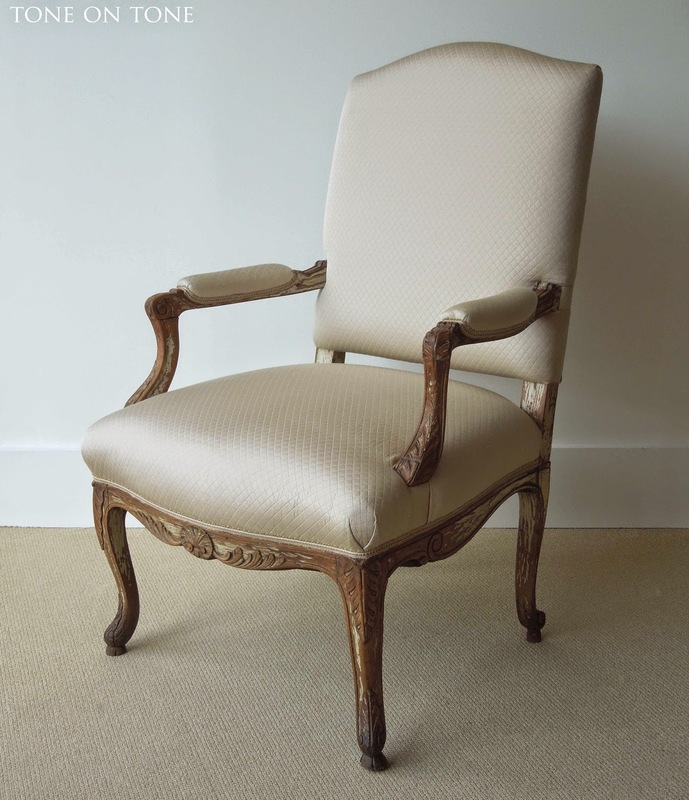 I had it updated and simplified with a neutral linen fabric, flat tape trim, and single loose seat cushion filled with down and feathers. Note its channeled frame with beading and finials terminating in scrolls. 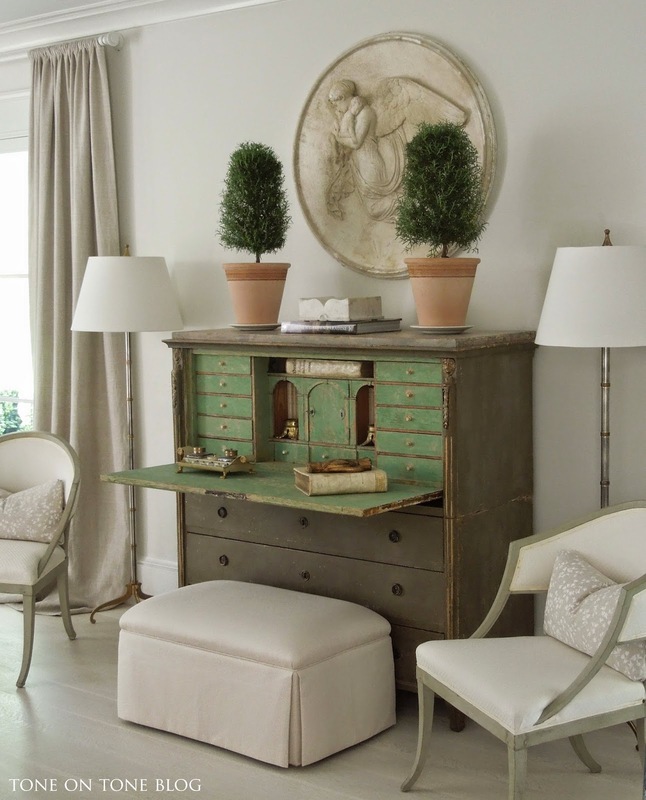 The color is more of a French gray than Gustavian. The pillow fabric is from Lisa Fine. 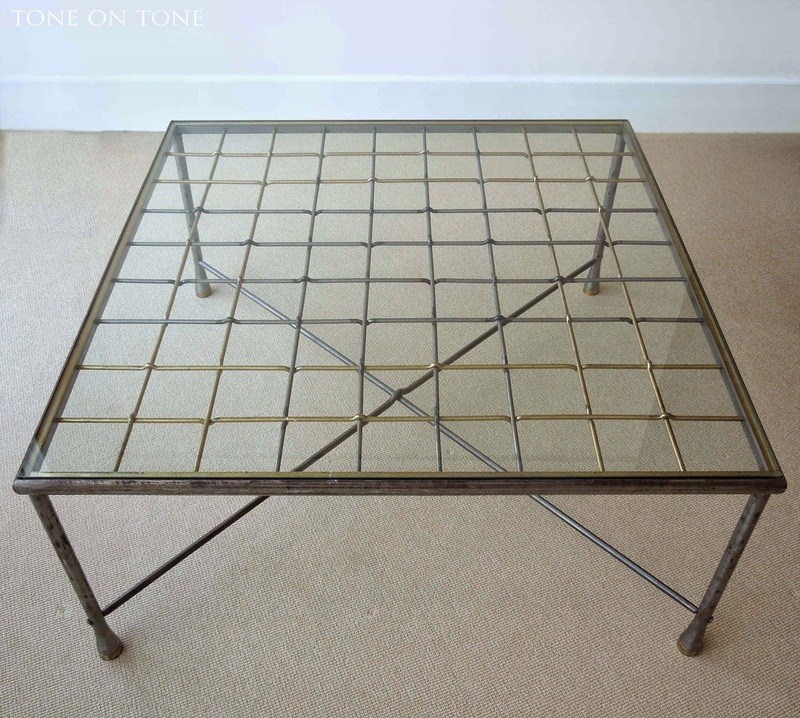 Here is a substantial steel and brass 43" square coffee table with an inset glass top. The grid design resembles a basketweave pattern. 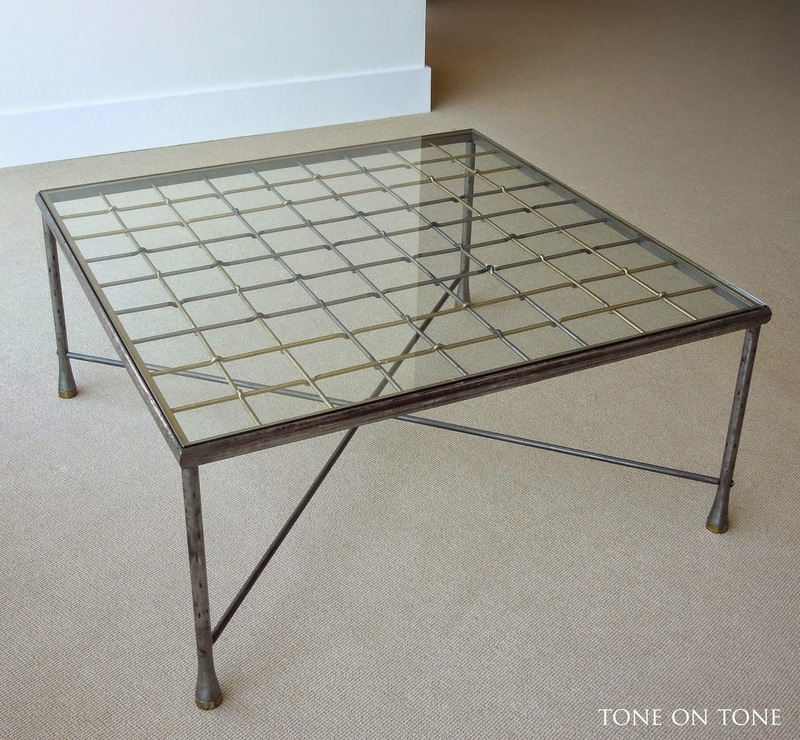 It's a piece that bridges classical and modern designs - even a bit industrial in spirit. 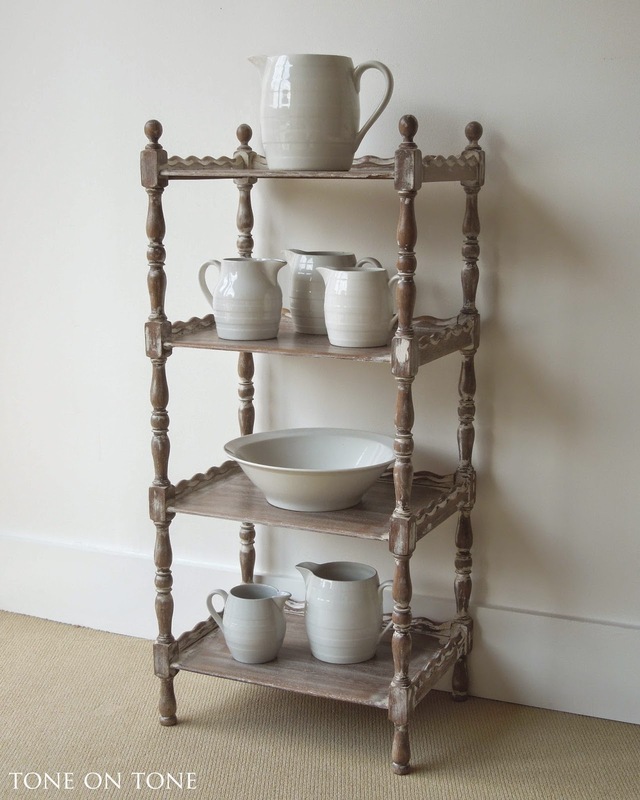 An English white-washed whatnot / etagere of useful size, this piece can hold books, china and even towels for a bathroom. I love the undulating lines! 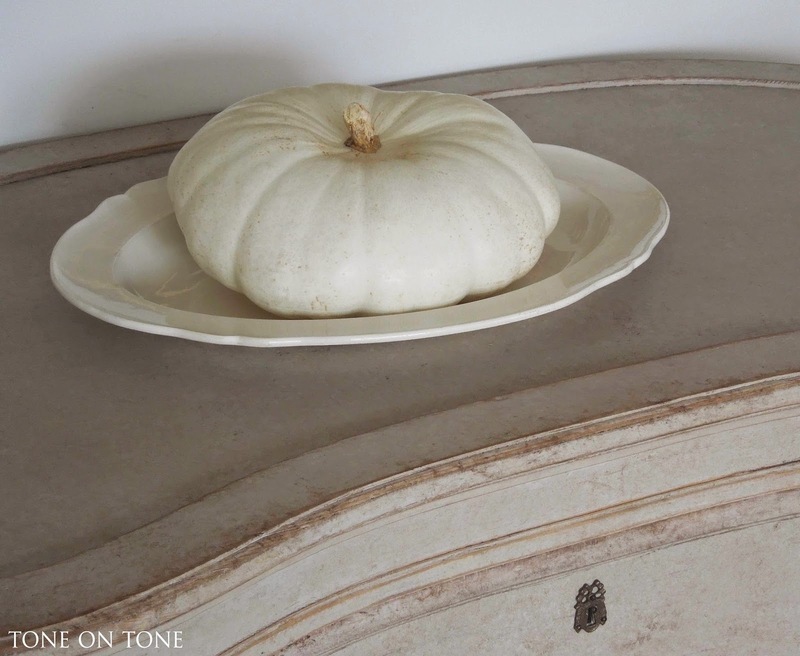 On this 1900s kidney-shaped freestanding chest by the Danish firm of Lysberg & Hansen, from Copenhagen, is a pale Lumina pumpkin served on a French creamware platter. 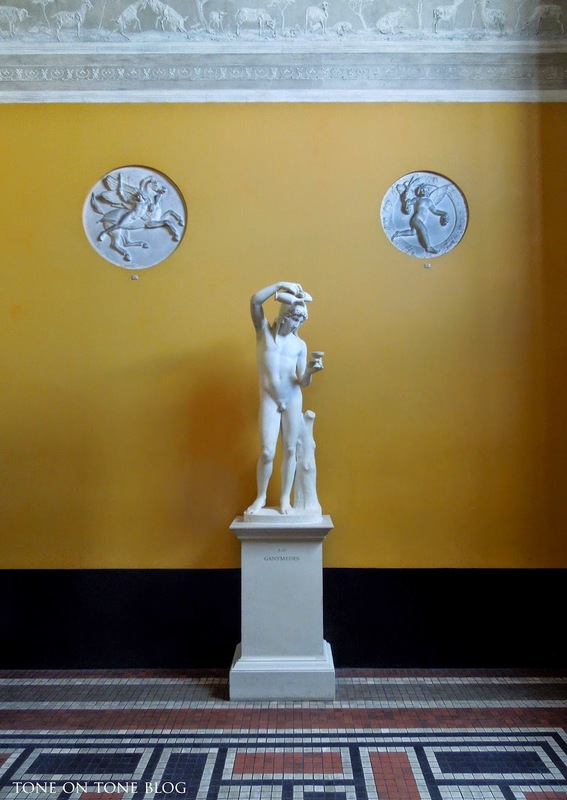 The giltwood mirror with mercury glass and plaster decorations is French. 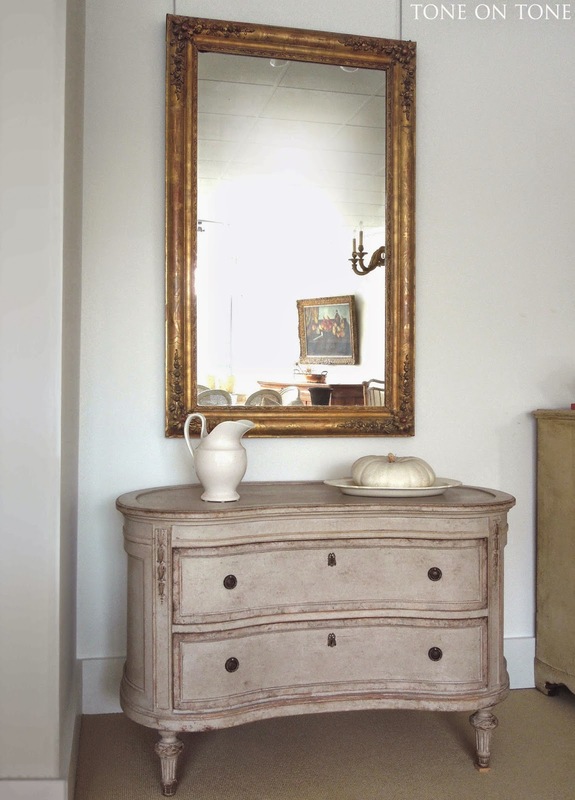 A diminutive Swedish Gustavian painted demi-lune table from the 19th century. 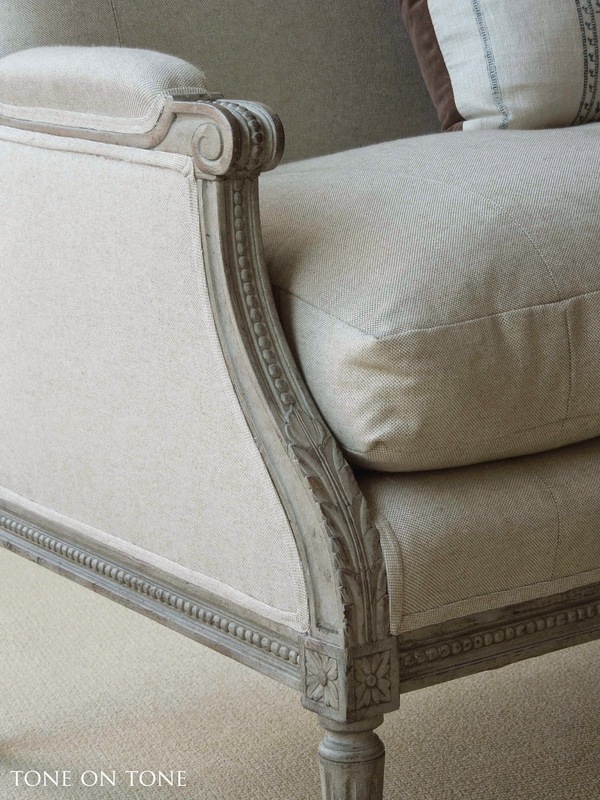 This Gustavian period window seat has been hand scraped to its early painted surface. 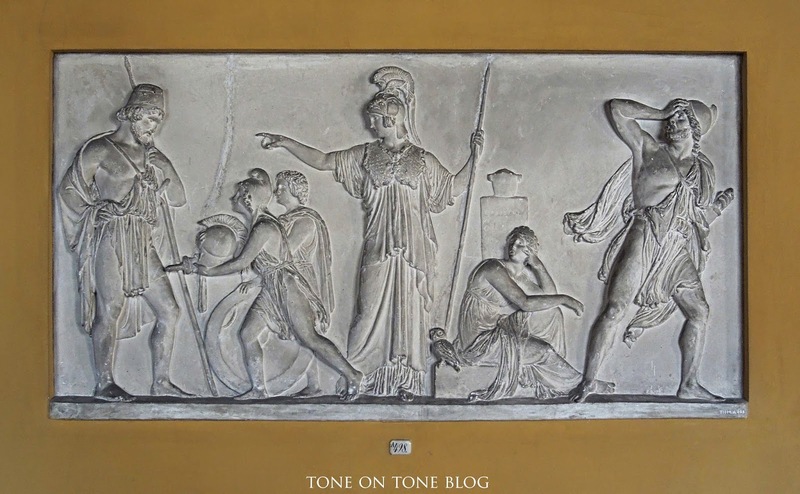 During the process, iron reinforcements / braces were discovered - I love finding these tidbits which are a part of the piece's history and character. 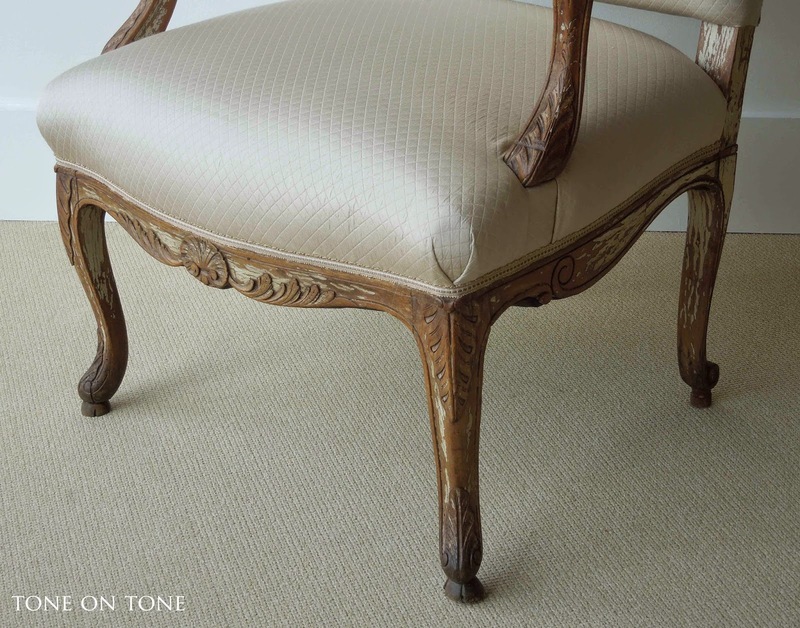 The stool is newly upholstered in a silk damask by Claremont. 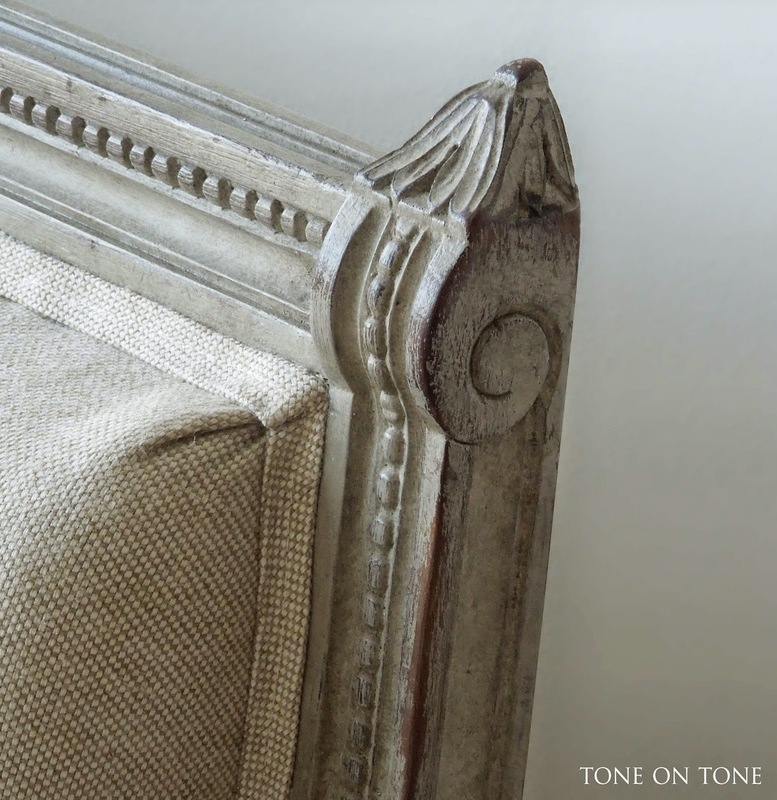 Cording is by Samuel & Sons, and gimp trim is by Scalamandre. 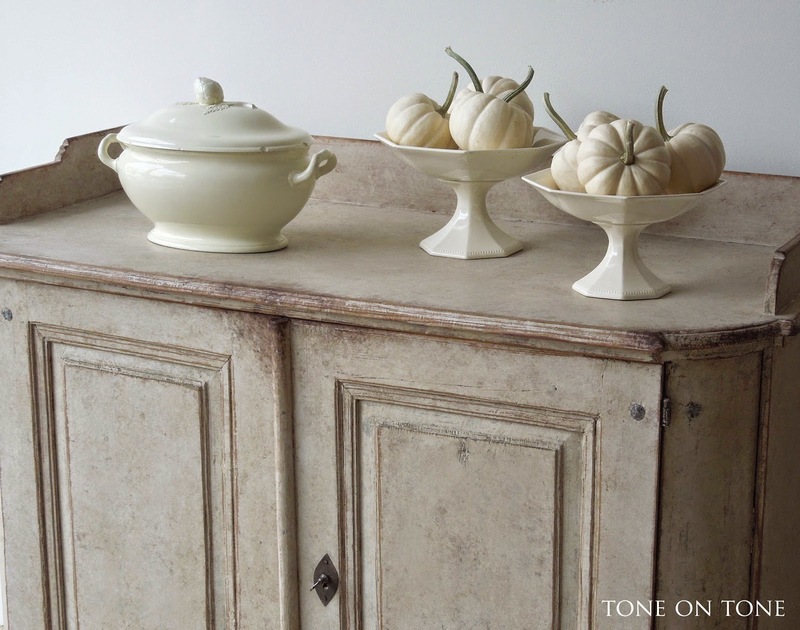 Antique French creamware fruit compotes filled with Baby Boo pumpkins. 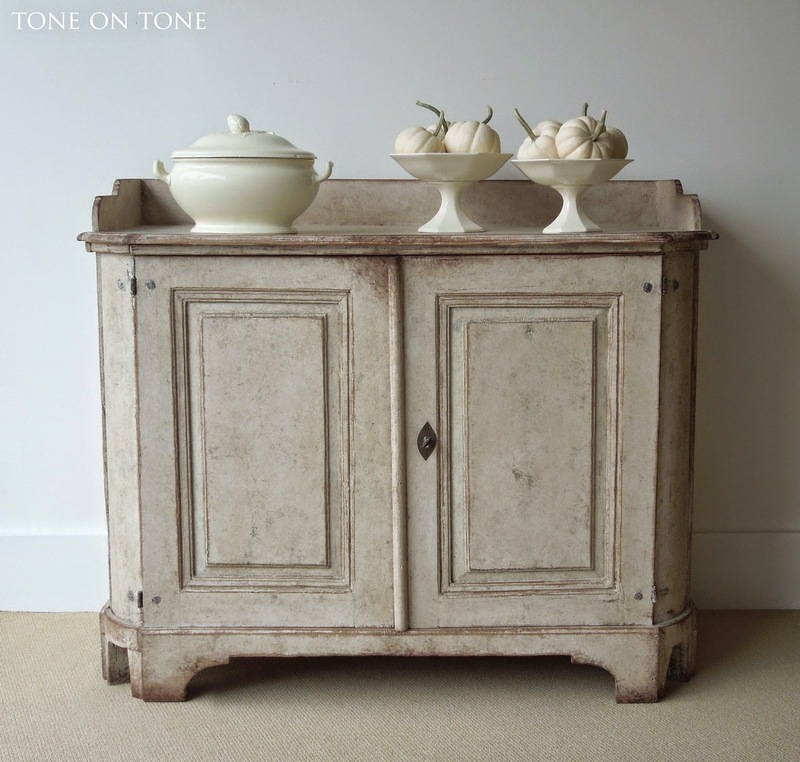 The antique creamware covered soup tureen is also French. 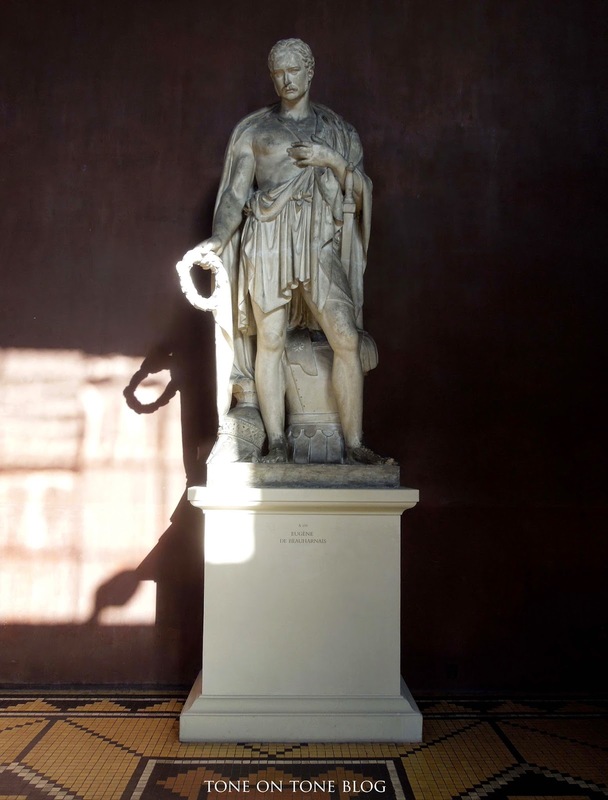 The Swedish Baroque cabinet is an early piece from the 1740-60s. It would be great under a TV or as a buffet server. 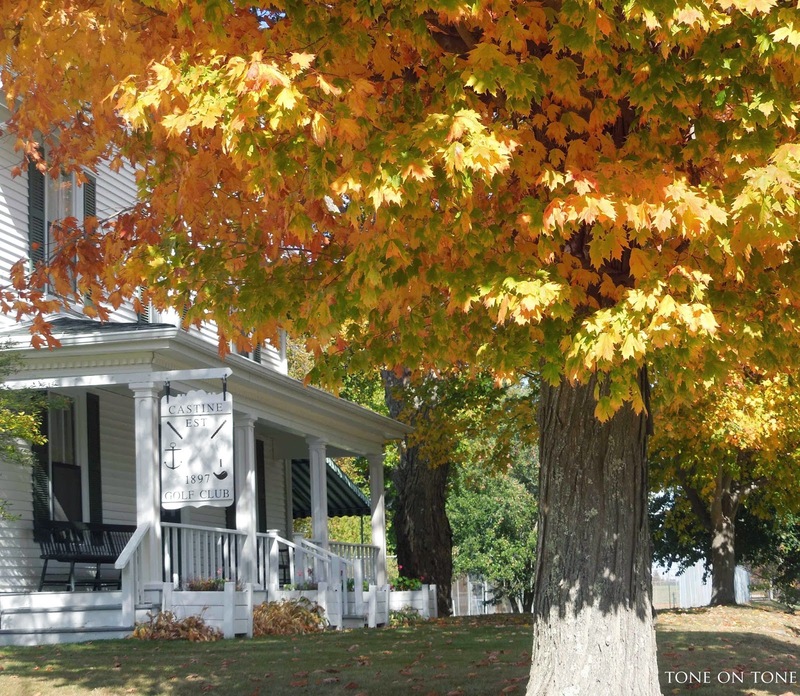 To see how I decorated in previous fall seasons, click on "autumn" on my sidebar under BLOG TOPICS.